July 1 2006 did not dawn clear along California’s far northern coast, contrary to what you may have read about Helios’ discovery. In the summer, it is never sunny in the morning in Eureka, Arcata, Orick, Klamath, and Crescent City. Instead a marine layer of fog settles in, as the interior of California is very hot in the summer, and that temperature contrast versus the Alaska current induced cool Pacific Ocean creates convective forces that lead to fog development. In fact, you can go onto Weather Underground and check the hourly observations at Crescent City’s McNamara Airport for that particular date, there was only a peep of sun in the later afternoon when the fog dissipated. I am sure it was the same in Orick, forty miles to the south. However, just a little inland, over the first hills or mountains adjacent to the Pacific Ocean, it was assuredly sunny by midday. 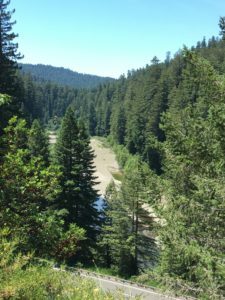 Redwood Creek flows into the Pacific in the south part of Orick area, and upstream winds its way south between the first ridge adjacent to the Pacific Ocean and the next ridge to the east which Bald Hills Road and the Tall Trees Grove road run along. 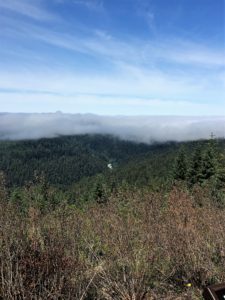 This positioning allows fog to enter Redwood Creek valley in the evening all summer long, but then since there is some distance and a ridge between the valley and the Pacific Ocean the fog retreats downstream along Redwood Creek by late morning, until it meets up with the persistent marine layer on the bend north of McArthur Creek. 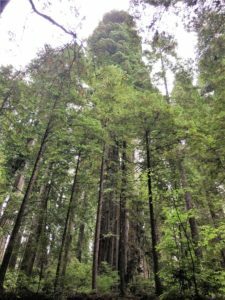 So the trees growing along Redwood Creek and the many creeks that flow into Redwood creek receive a decent dose of fog drip all summer long to support the leaves in their upper canopies. However they also get a lot of sunshine as well since that fog retreats for most of the day. 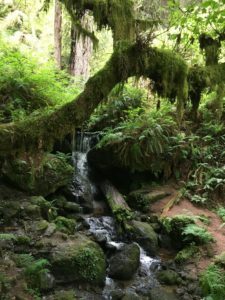 Redwood Creek and its tributaries have many bends and in some places flow in an orientation that protects trees from the highest winter winds, which are usually from the south. If the tree grows along a creek with an east west orientation, such as the bend in Redwood Creek at Tall Trees Grove or along Tom McDonald Creek, and if the tree has hillside protection, that strong southern wind from the winter “Pineapple Express” storms can whistle along mostly above the tops of the tallest redwoods. 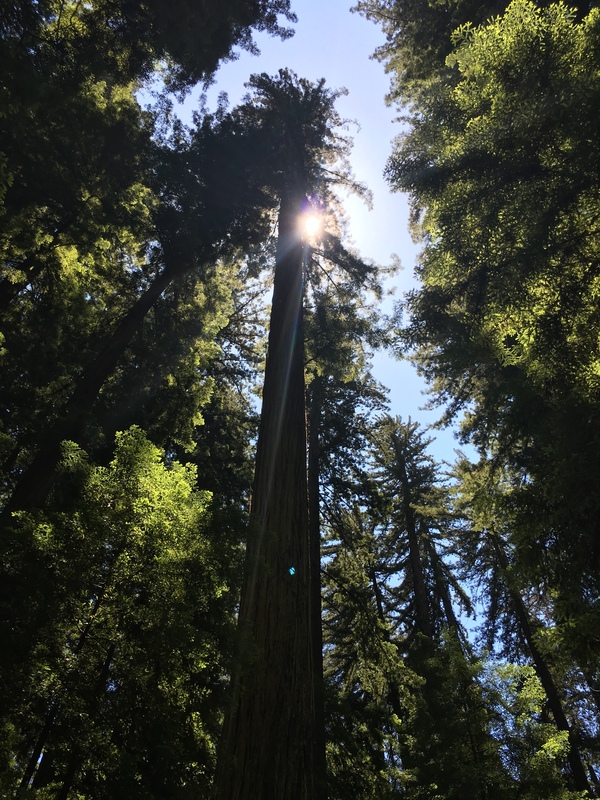 For these reasons – summer fog and sun, wind protection, and also soil condition, the redwood trees along Redwood Creek and its tributaries can get very tall. And not just right along the creeks, but on the terraced steppes above the creeks, on steep hillsides. Helios and Hyperion were discovered on July 1 and August 25, 2006, respectively. 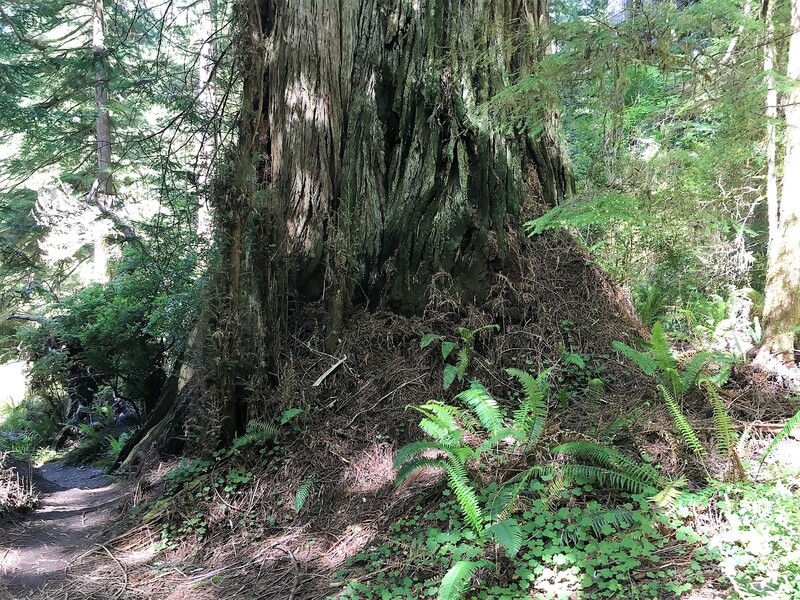 Both trees were found growing on steep hillsides above tributaries of Redwood Creek. 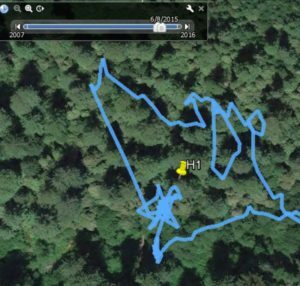 Both were found by Chris Atkins and Michael Taylor using a newer technology which involved a hand held laser beam with some internal machine ware that returned distance and angle to reflective target. Using this information geometry can be used to find tree height, as the opposite angle (angle to reflective target) and hypotenuse (distance to reflective target) are used to determine target height (using sine table). Typically the machine ware will also do this calculation. However it is almost never quite that easy as the top and bottom cannot usually be captured in the same measurement, so a series of incremental measurements are made. Throw in a forest and rough terrain and this becomes pretty tough and exacting work. Then one other issue is where ground level is on wide hillside trees, where the upslope side of the trunk can be twelve feet higher than the downslope side of the trunk. 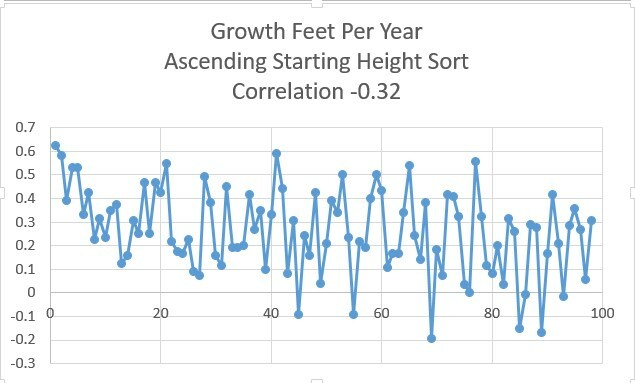 So the height is calculated as the average of downslope and upslope height. 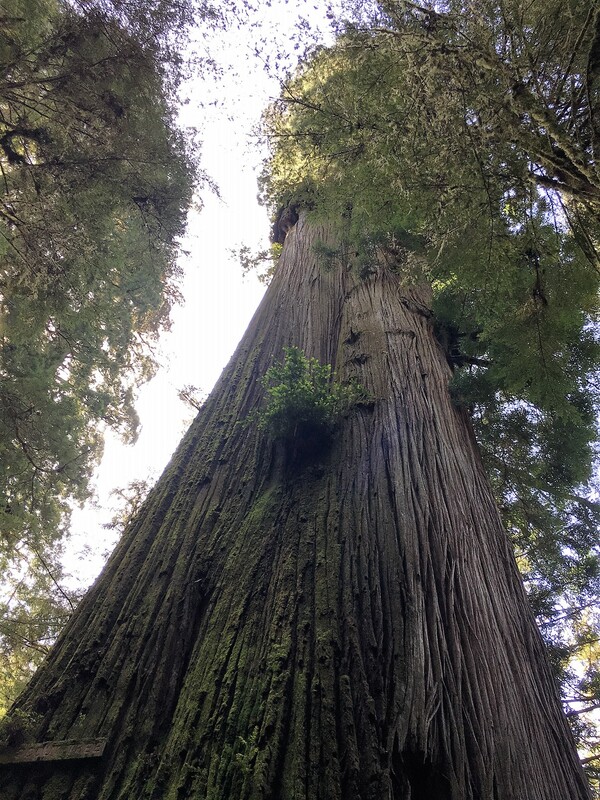 Helios’ height was measured at 374.3 feet, which was about four feet taller than the previous tallest measured tree, Stratosphere Giant in Humboldt Redwoods, and about three feet taller than Icarus, another tall tree in the Helios area also discovered on July 1, 2006. Then Hyperion was discovered in August and measured at 379.1 feet in September. That was almost five feet taller than Helios. Since Hyperion and Helios stood so much further ahead than other trees in height, especially Hyperion, and since so many tributaries of Redwood Creek were logged before being incorporated into Redwood National Park in 1964 and 1978, it is probably true there were other tall trees of similar height that were cut down in the 1960’s and 1970’s. 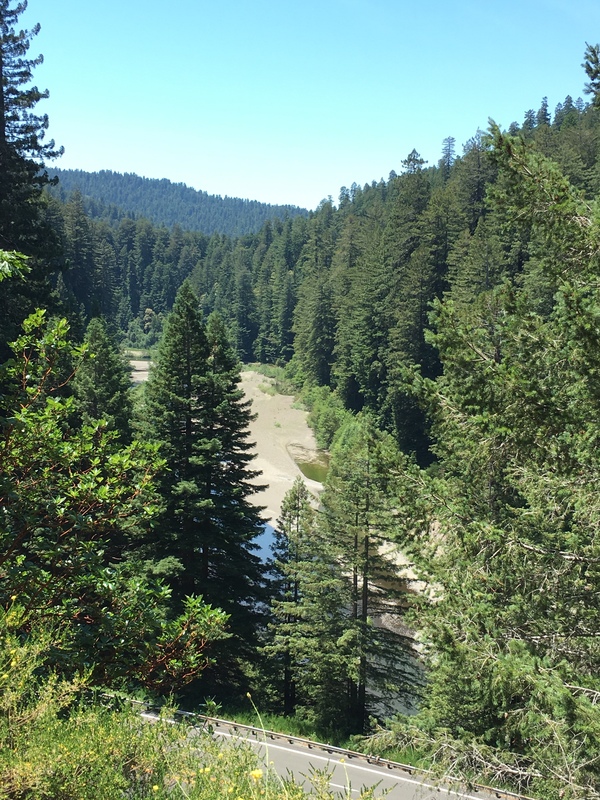 Looking at the winding creeks and Redwood Creek itself, incorporating altitude, soil conditions, distance above creek, and wind protection there were maybe a half dozen redwoods in the area above 375 feet tall in 1960. Hyperion at the time was probably around 370 feet tall. 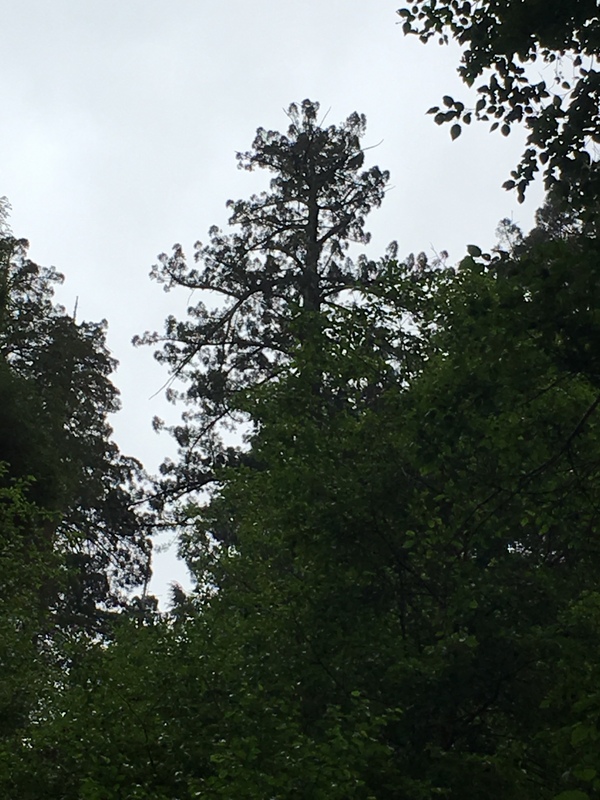 How tall the tallest one was, it will never be known, but it could have been 390-400 feet tall. 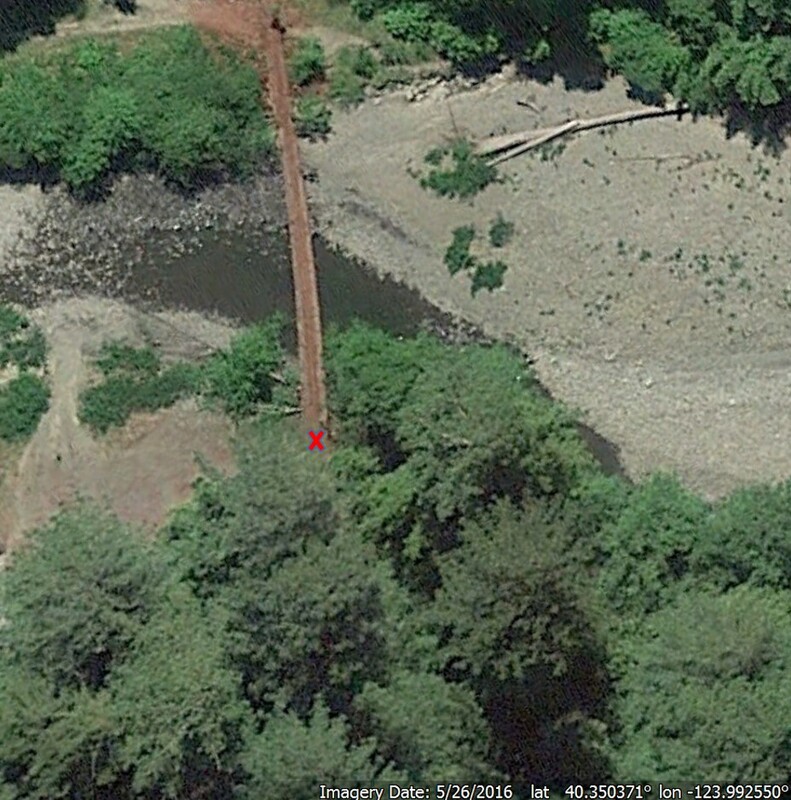 Maybe it was along Forty Four creek. Helios’ height is increasing faster than Hyperion’s. This is probably due to the fact Helios is growing back toward its maximum height. About a hundred years ago the top broke off of Helios and it went from a 400 foot redwood to a 350 redwood in a couple seconds. So Helios’ height growth is based on branch reiterations. Hyperion’s crown does not include reiterated branches, its crown height has to increase as a general push upward of the intertwined canonical canopy. So Hyperion is presently at its historical maximum height. Another very tall tree in Humboldt, the Stratosphere Giant, is growing in the Rockefeller Forest just a little ways from Bull Creek in a general area that has supported trees that were possibly 400 foot redwoods before their tops broke off (Giant Tree and Bull Creek Giant). 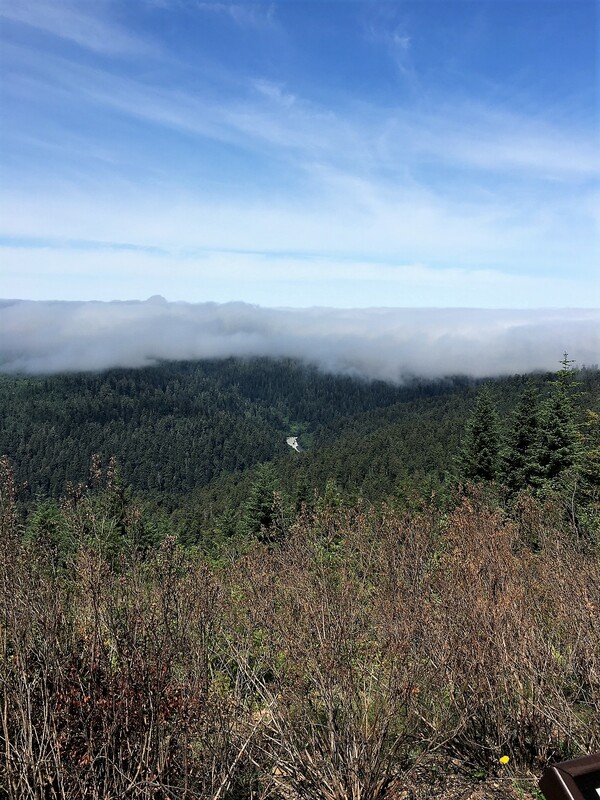 The Humboldt locations are on flats versus on hillsides, with summer nightly fog flowing up the Eel River and into Bull Creek and with good protection from high winds due to Grasshopper Mountain as well as an east-west valley orientation. 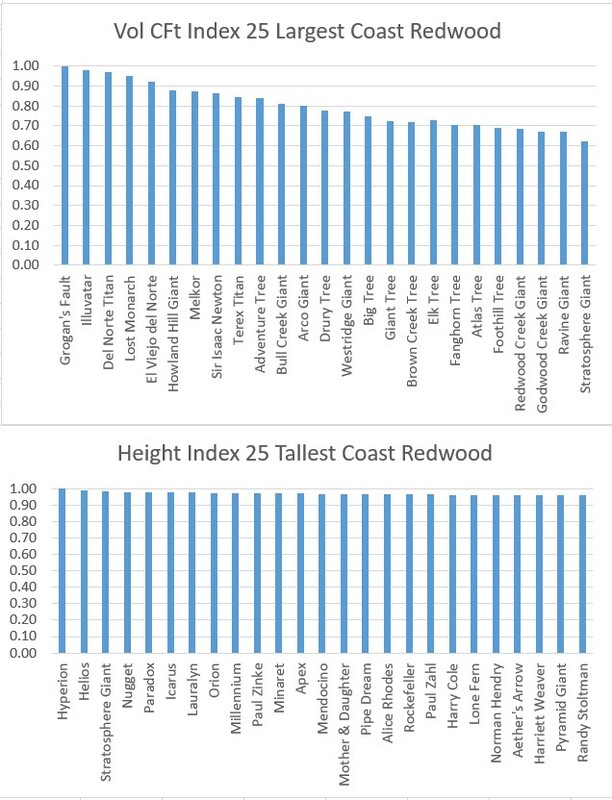 Here are some recent actual heights for the tallest redwoods, along with growth rates. 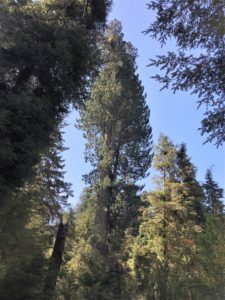 As is apparent, barring a wind event or substantial change in relative growth rates, Hyperion will remain the tallest tree on earth for some time. 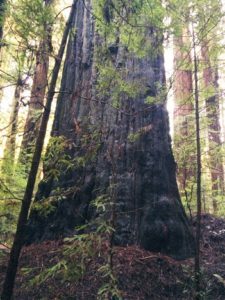 It would be exciting to see a 400 foot redwood, and it will probably happen. But it will take another 50 years for a tree to get there. I would guess that tree will either be Helios or Stratosphere Giant. 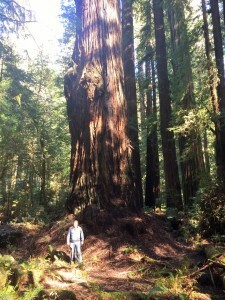 But it is amazing enough there is a 380 foot redwood growing in Redwood National Park right now, Hyperion. 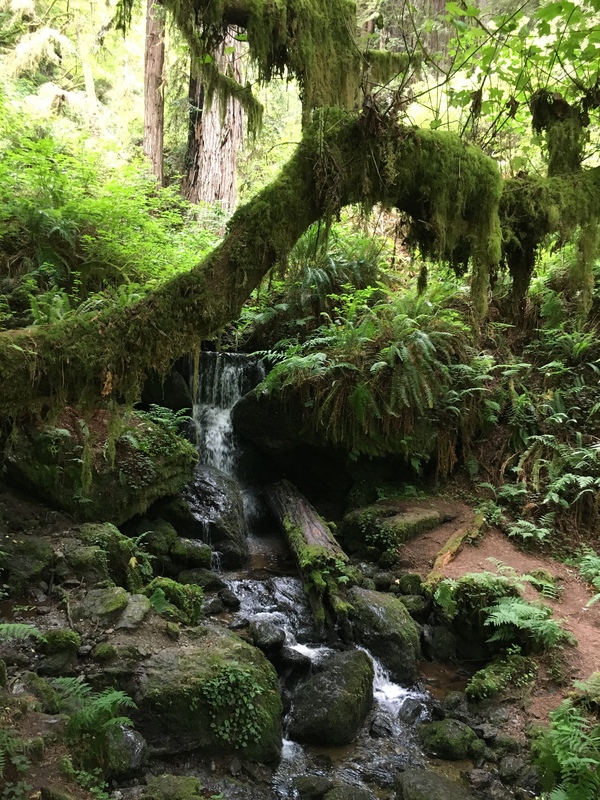 Jedediah Smith Redwoods State Park can certainly be described as Crescent City’s forest. 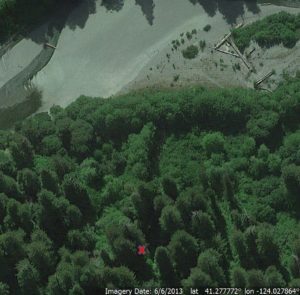 When viewed in Google Earth the start of the park is very abrupt, with farm land, commercial land, and housing immediately to the west of the park’s border. 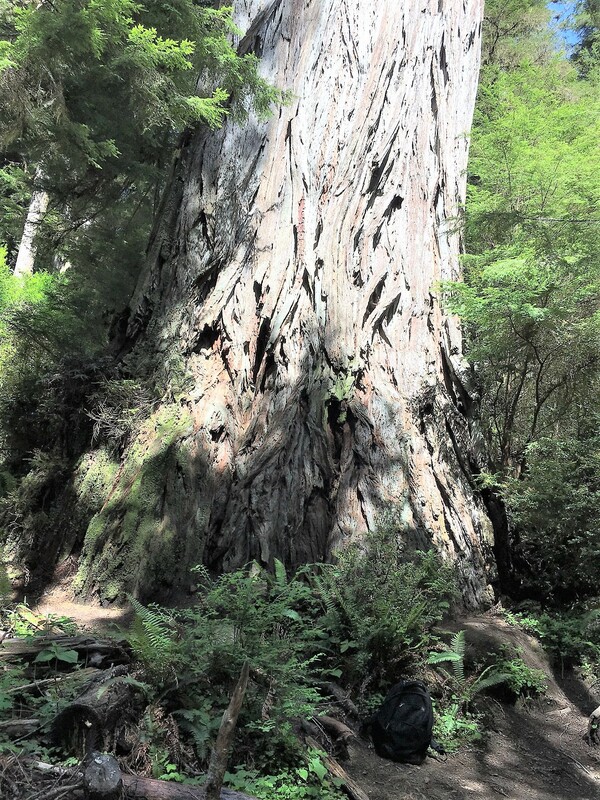 As an example the Boy Scout Tree redwood is less than three miles from the Crescent City Walmart. But don’t be fooled, there is a lot of remoteness for much of JSRSP. 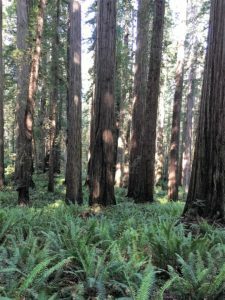 There is an especially big patch of redwoods south of Highway 199 and north of the Boy Scout Tree trail that is pretty much free of trails and roads. 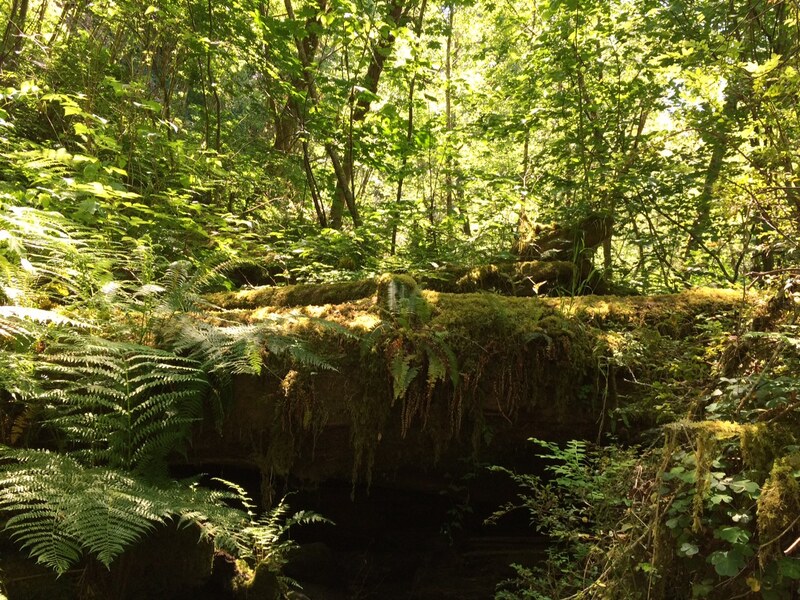 On a Saturday in August Mario and I did some exploration in this forest. Not to any known giant trees, but just to look around. This area has a wrinkled landscape and receives a lot of rain. 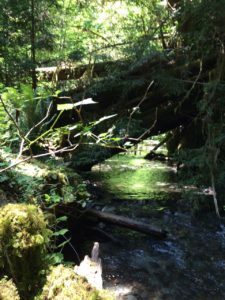 Therefore there are many creeks, generally flowing either north toward Smith River or south toward Jordan Creek and the Pacific ocean. In one valley the water may flow north, then crossing to the next valley, at the same latitude, the water may flow south. We took our time, looking over a small portion of the area, and found some really interesting “stuff”. We found this big whopper redwood with one of the nicest crowns you’ll ever want to see. 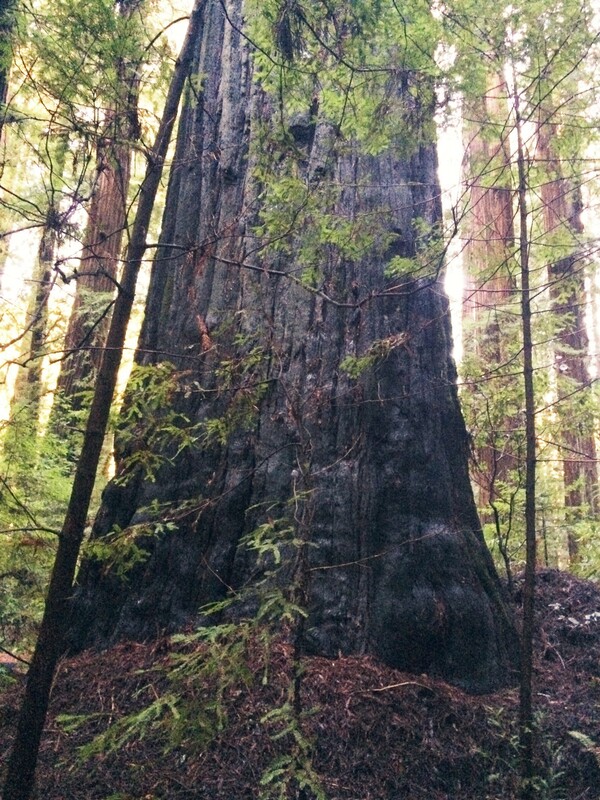 Large redwood with huge crown, a boiling cloud of green. 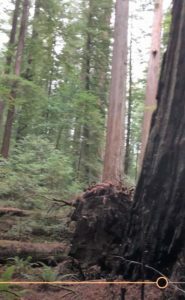 Then this is a classic nursery log, with a line of ten or so young redwoods growing out of the log. 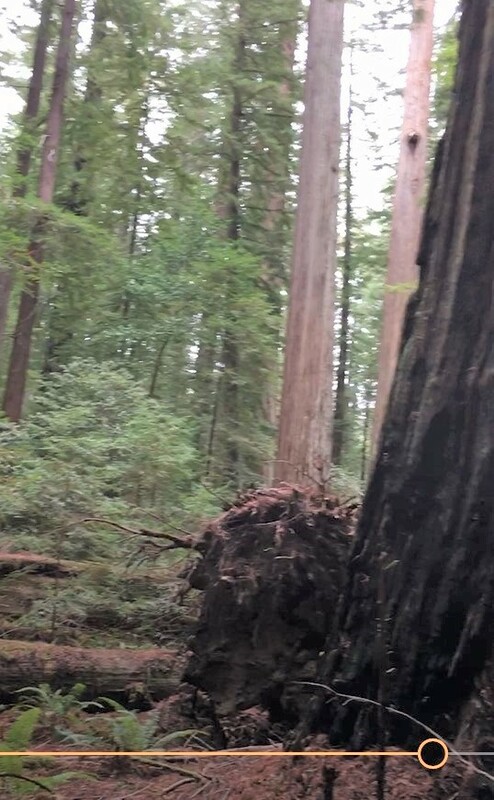 That’s Mario along the log. 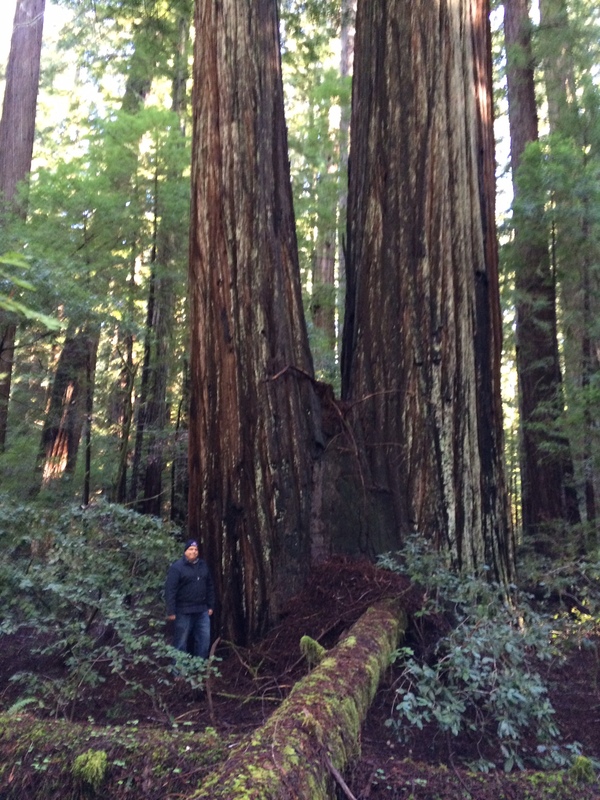 Here’s a nice cluster of big redwoods, maybe they can be called the Crescent City Towers. Occupants are flying squirrels and marbled murrelets. Mario’s in lower right for scale. 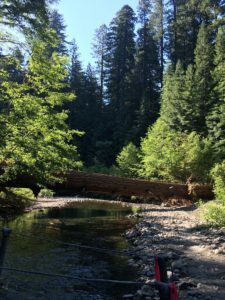 Just above one creek sits this redwood grouping. We gave it the name Elk Herd as there are elk sign in this area, lots of hoof prints and nibbled off vegetation from earlier in the summer. 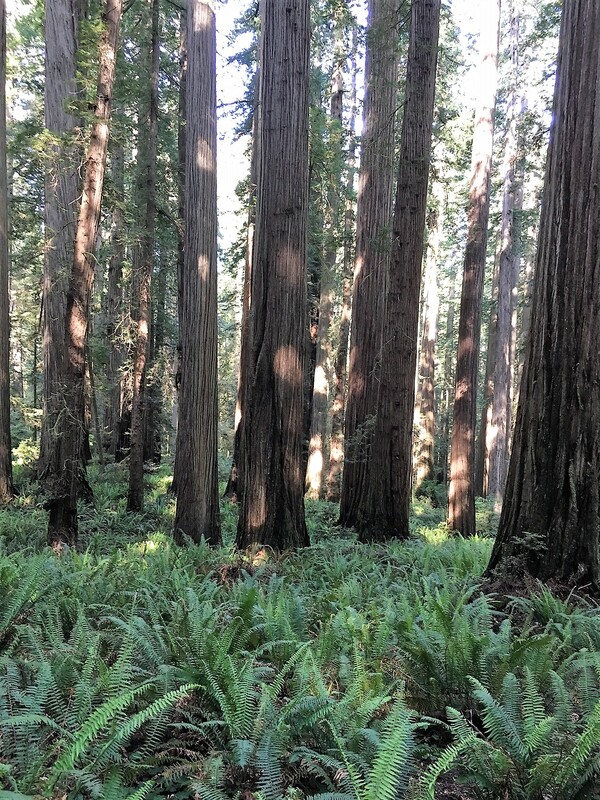 It would be quite a picture to get a herd of elk surrounding this herd of redwood trees. Mario has a good picture of this grouping on his website where you can discern the impressive size more clearly. But let me just say, at 4.5 feet above the ground, there is 35 feet of pure redwood diameter, no spacing. The big one in the middle is over 20 feet diameter. That evening Mario organized a FB meetup at a brew pub in Crescent City. 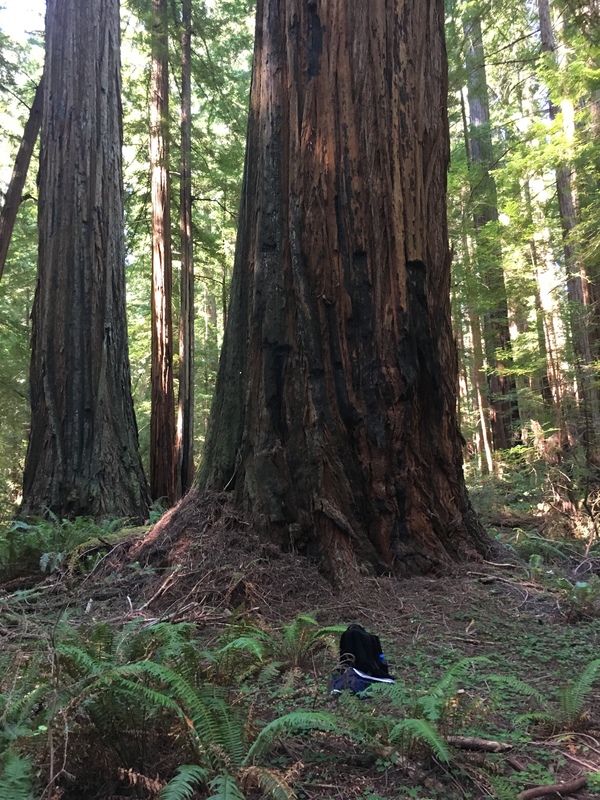 He got a good turnout, both people interested in redwood photography and redwood hiking. About 25 in all, everyone had a good time. Harper Flat contains about 30 redwoods over 350 feet in height in an area no larger than 400 yards X 300 yards. That’s quite a tight grouping of tall trees. 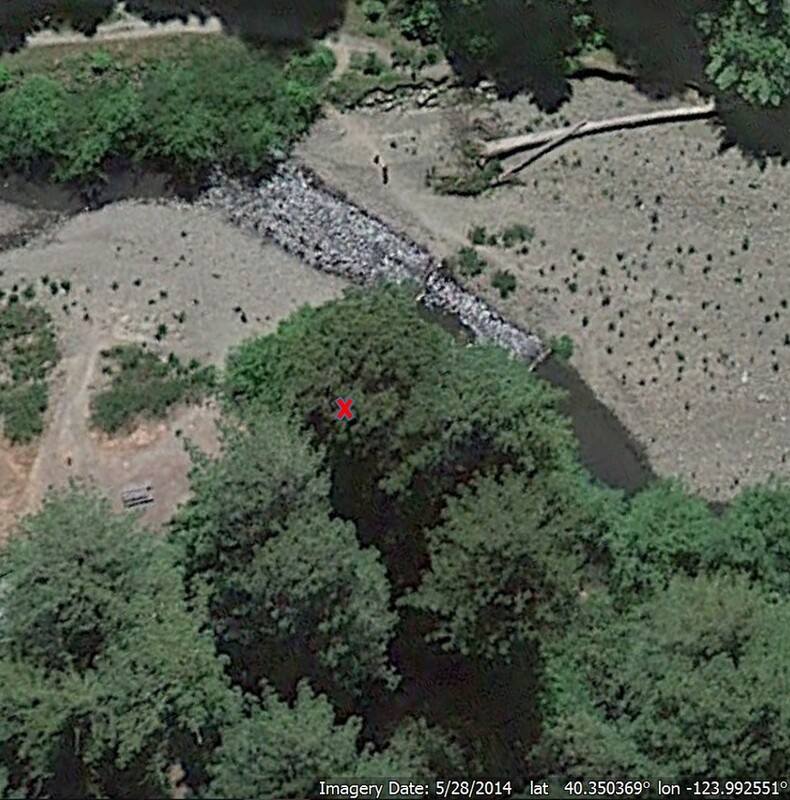 It sits on the south side of Bull Creek a little bit east of Giant Tree. The Bull Creek south side trail goes right through a section of Harper Flat. Over the last few years I’ve been through Harper Flat a few times, and have seen every tall tree in that area. But I didn’t know which was which. 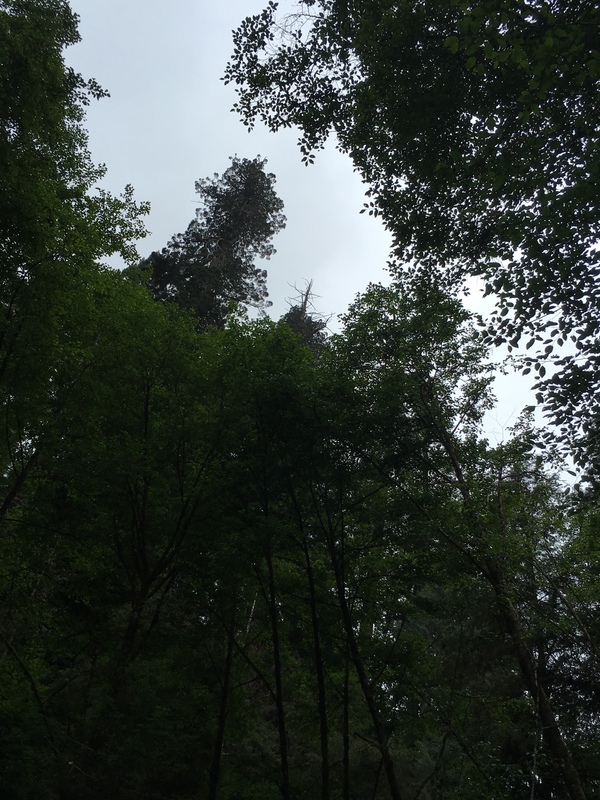 The trees themselves are on some published lists with heights and diameters. 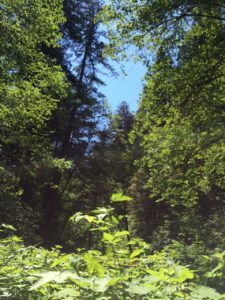 But height is difficult to determine in the forest and there are many similar diameters and fusions in the area. Recently I collaborated with an expert tree seeker, combining some clues we had with some new technology, and we were able to come up with a pretty good layout associating specific crowns with specific trees in Harper Flat (any in many other areas). 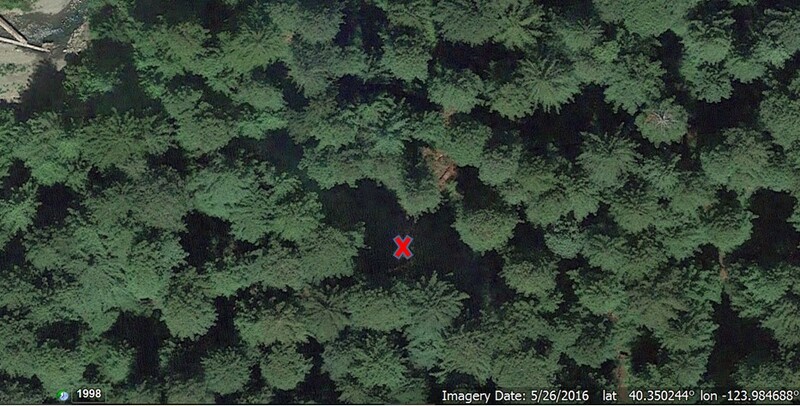 In May it was time to put the technical findings in action and do a transect of Harper Flat. We had GPS, range finders, D-Tapes, and some custom created maps to assist in the effort. Working generally southwest to northeast we identified with high probability all the tallest trees in Harper Flat, including the notable trees Valentine, Apex, Alice Rhodes, Mother and Daughter, Pyramid Giant, and Randy Stoltmann (the order listed here is random). There are many large fallen logs in Harper Flat which makes getting from point A to point B circuitous. Then also some of the notable trees are tucked in areas with the logs and brush, so care must be taken. There was also quite a bit of bear poop in Harper Flat, a bear or maybe a bear and cub must be accessing Bull Creek through this area. To be honest the most scenic and impressive trees I saw in Harper Flat were none of the trees noted above, but instead a couple named Big Log (Brutus) and Bushy Toe. Both are over 350 feet and have large diameters. Big log 361 feet tall, 15.5 foot diameter. Bushy Toe 351 feet, 17 foot diameter. This tree is just north of the Bull Creek south side trail. Then also it should be mentioned there are two spectacular signed trees nearby. On the south side of Bull Creek is Giant Tree, 354 feet, 17 foot diameter, while nearby on the north side of Bull Creek stands the stately Rockefeller Redwood, 366 feet, 15 foot diameter. 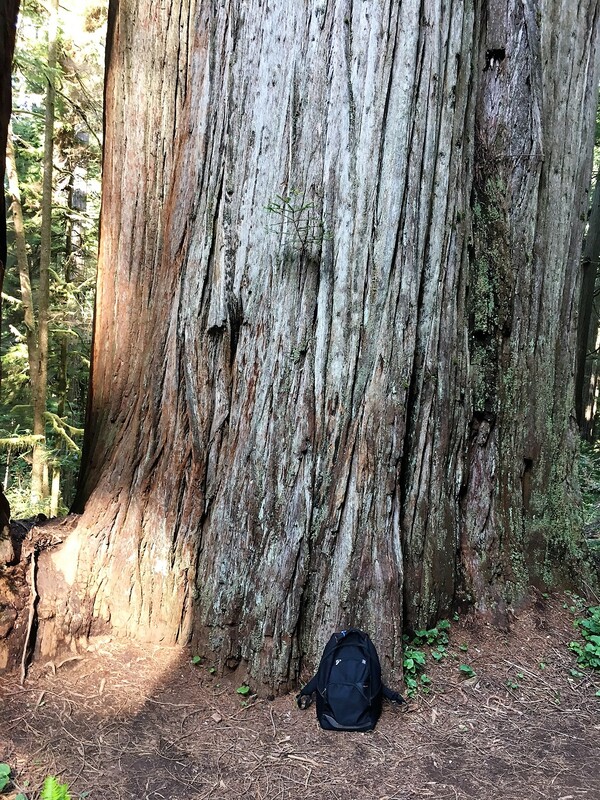 Giant Tree. About nine feet shorter than the sign says. We saw quite a few people in the area on this day, even off trail. Almost all had a friendly hello and we chatted for a bit about hiking and redwoods. 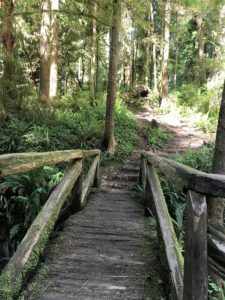 However when we were rounding a bend in the trail we met two guys going in the other direction who ducked down and started tying their shoes. It was clearly avoidance behavior, not wanting to be seen. They had nice cameras and tripods. Anyhow we said a brief cursory hello and moved on. 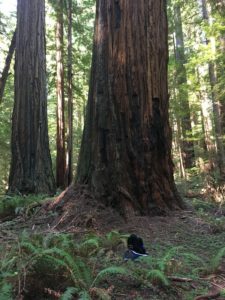 I suppose this all sounds strange to some, but there is intrigue in the redwoods, some people have gone rogue and put out GPS, hiking directions and very nice photos for a bunch of specific trees, even some way off trail. Now this is contrary to the current status quo, very contrary. And the people doing this have chosen to remain anonymous. I think these people would be more effective in their endeavors if they took credit for what they have built and made their case for the site content. I agree for some trees right by trails it is pretty silly to keep them a “secret”. But then for others, way off trail, it is pretty risky to send people over hill and dale to get to the trees. Then there is a lot of ground in between. Maybe some common ground can be found. The Boy Scout Tree Trail is a great hike through the heart of Jedediah Smith Redwoods State Park, starting from a big grove along Howland Hill road then winding all the way northwest to Fern Falls which is very near the western border of the park. 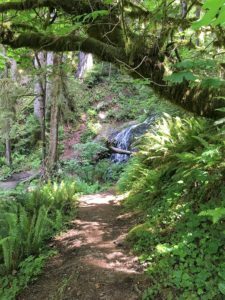 The trail goes up and down a 400 foot hill and a smaller hill and makes its way along slopes, uplands, and creek bottoms. 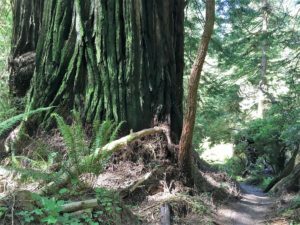 It goes by many large redwoods right by the trail, and most of the trail provides expansive views of the redwood forest. Then at the end Fern Falls is very beautiful. This is an out and back trail, with the start and finish at Howland Hill road. GF Beranek has published a new book covering Jedediah Smith and Del Norte Redwoods State Parks. This is an excellent resource, with beautiful photos not just of redwoods but also photos and descriptions of their forest habitat including companion tree species, plants, mammals, birds, reptiles, amphibians, and insectivores. 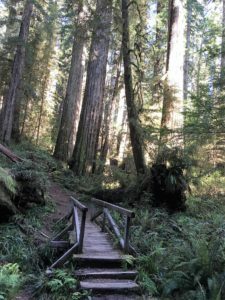 Every section and trail in the park is covered in detail, including twenty pages dedicated to the Boy Scout Tree Trail. 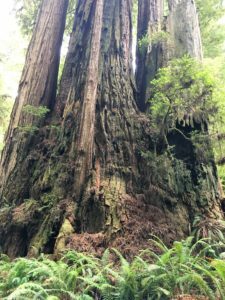 This is a companion book to earlier publications on Humboldt Redwoods, Prairie Creek Redwoods, and Tree of Dreams and Fortune, all very good. You can find these books in some of the visitor centers and almost all the gift shops around the redwood parks. It should definitely be a fixture in the Jedediah Smith Redwoods State Park visitor center. 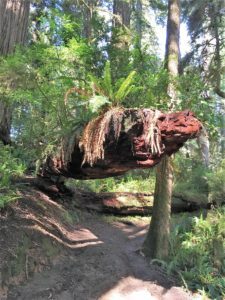 Dave Baselt has a web site redwoodhikes.com which covers all the trails in all the redwood parks, with topographic maps, elevation profiles, hike descriptions, and photos. In addition his waterproof large foldout park maps can be ordered online or purchased in the park visitor centers. I always bring and use his related map when I visit a park and hike a particular trail. Mario Vaden has built quite a redwoods web site, which can be launched off his commercial landscaping website mdvaden.com. Lots of photos, essays, and trail descriptions, including the Boy Scout Tree Trail. Some of his photos are for sale, including his famous epic sunset view of the Geisha Redwood. 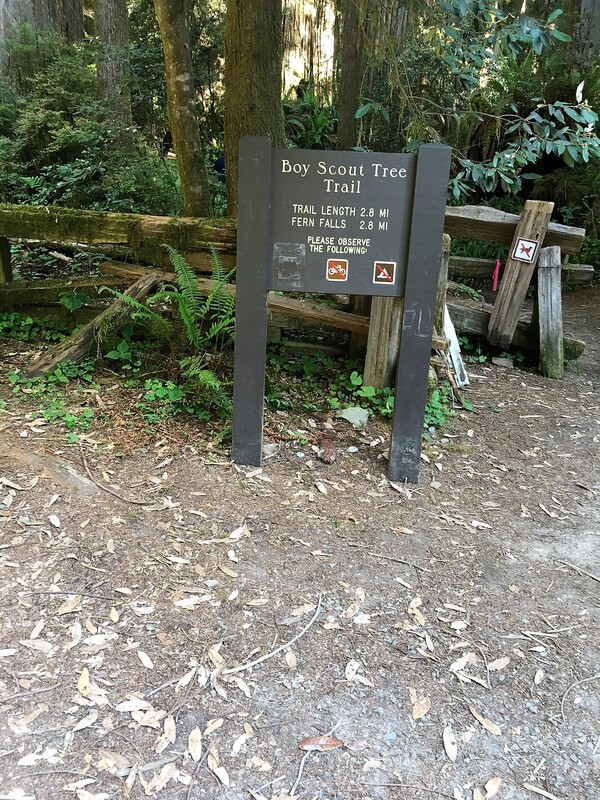 The trail head for Boy Scout Tree Trail is on Howland Hill road about two miles north of the southern park entrance. 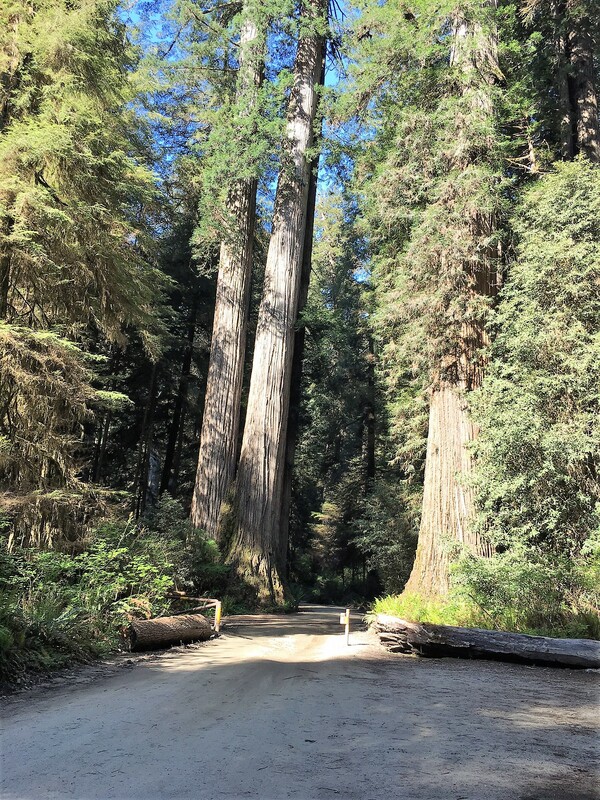 Howland Hill road is a great drive among big redwoods. It is more or less a 10 mph road, given the bumps, blind corners, some tight squeezes between trees, and lots of pebbles which can work their way into your wheel cover or brakes. Plus driving slower keeps the dust down. I arrived on a sunny weekend day about 9 AM. There were a few cars parked at the trail head. When I finished this hike about four hours later there were about 25 cars at the trail head and in side slip spaces nearby on Howland Hill road. 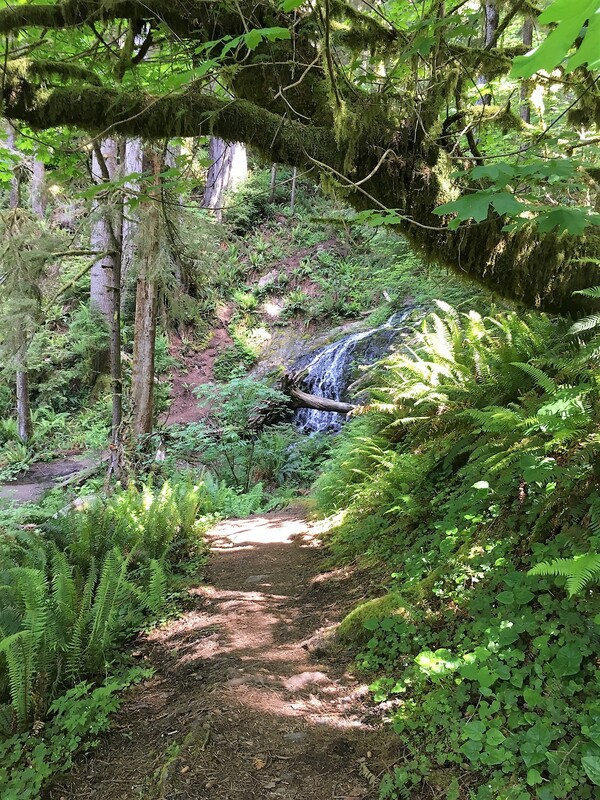 Maybe I met 75 people on the trail going out and back, which means running across a person or group every five to ten minutes or so, so lots of solitude as well. 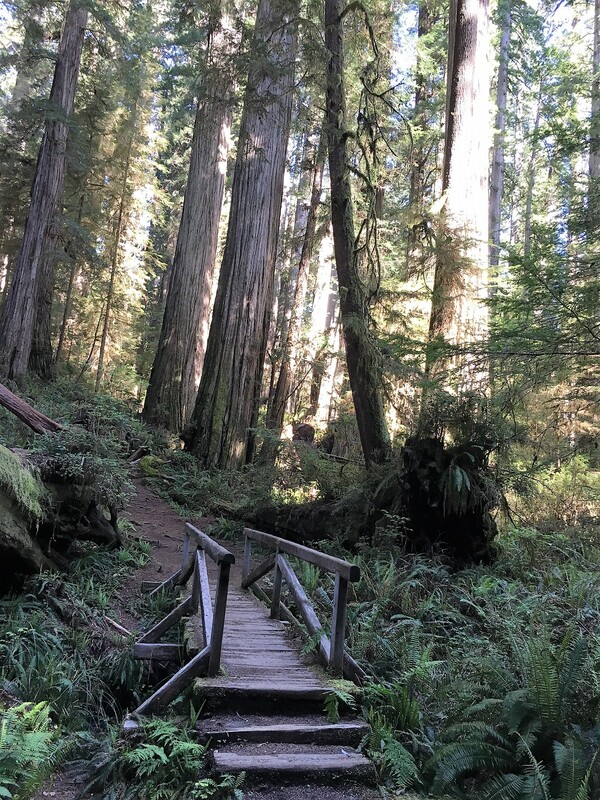 The first part of the trail is flat, then starting at the scenic bridge shown below it starts to climb at a moderate pace for about a mile or so, passing some big redwoods by the trail with expansive views to the north. 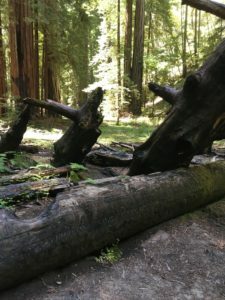 There is a under duct under one old log that kind of looks like a giant crocodile. Upon reaching the summit I anticipated catching a bit of the cool ocean breeze as described by Jerry Beranek in his book. And by golly, there it was, smack dab on top of the hill. In addition to the northwest ocean breeze there is a hint of salt water in the wind. 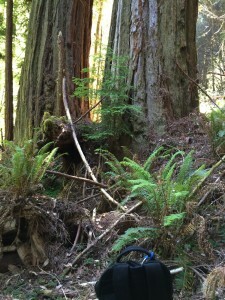 The trail then circles around the hilltops, with nice redwoods growing among fern dominated ground cover. But what goes up must come down and eventually the trail starts to descend toward the Jordan Creek valley. Here on the west side of the hill the terrain is more wrinkled and rugged, as is the trail. There are lots of roots to negotiate, which can be your friend when braking going downhill or looking for steps going uphill but can be your enemy when catching a toe. 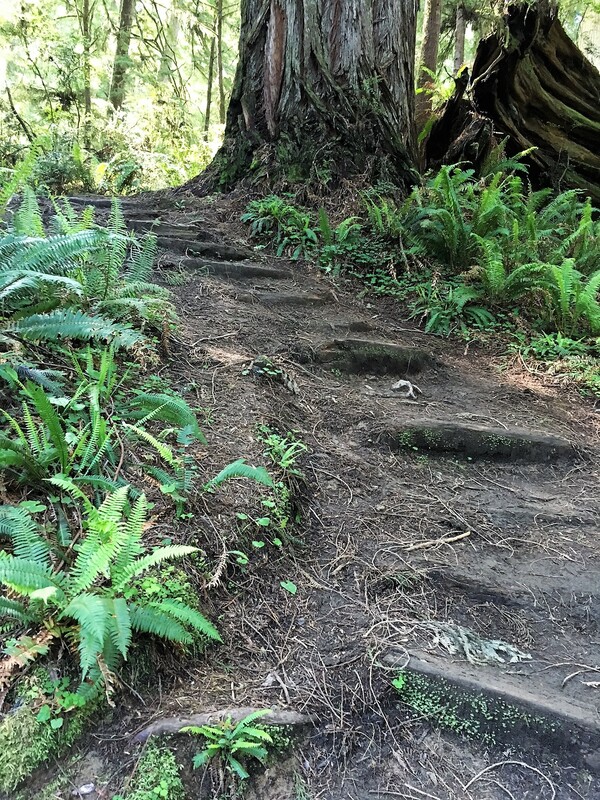 In fact it is so steep in places steps have been built into the trail for assistance. These help a lot. Jordan Creek itself is pretty small where the trail crosses near its headwaters. 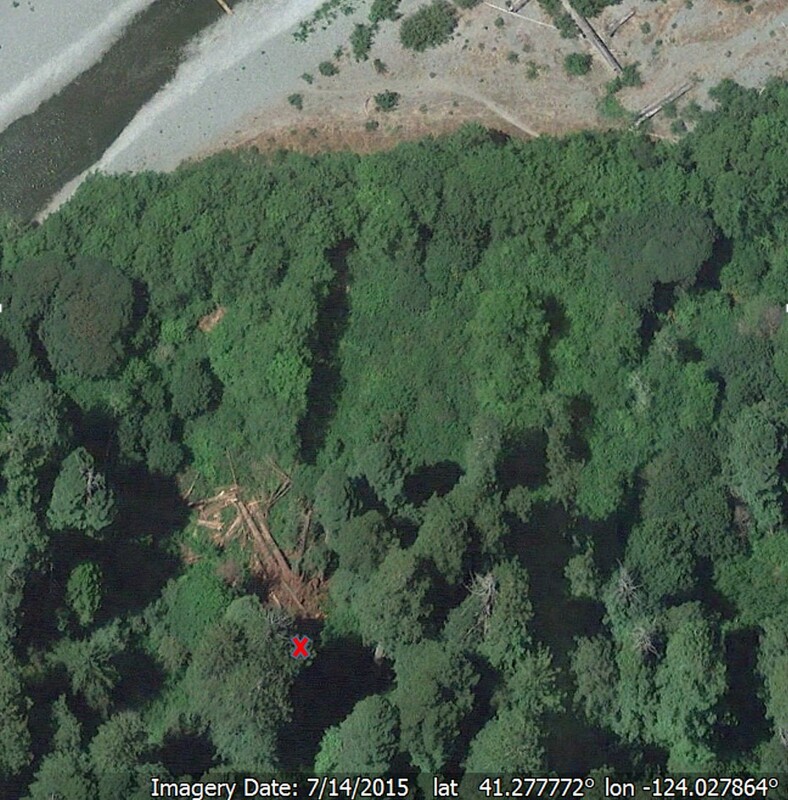 But still it is a very dense setting, with lots of huckleberry and western hemlock mixed in with the redwoods. 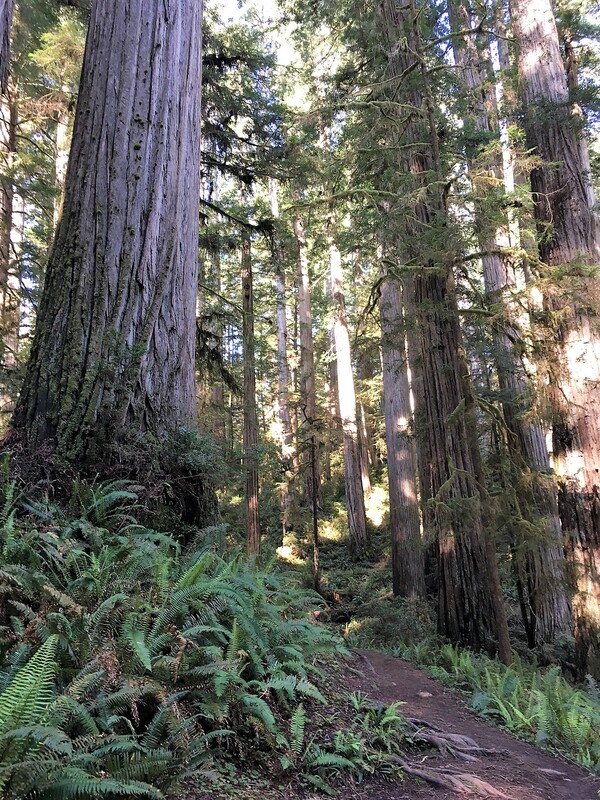 There is a RCCI study plot in the back country on the west side of JSRSP, not particularly near this trail but having the same type of redwood habitat, which has the greatest measured biomass density of any area on the planet Earth. 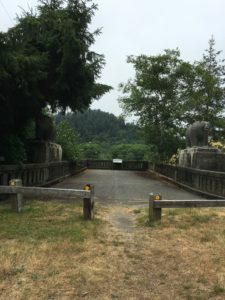 After crossing Jordan Creek there is a short climb to hill side terraces which follow the generally westward path of Jordan Creek. The trail follows these steppes around some bends and pockets. 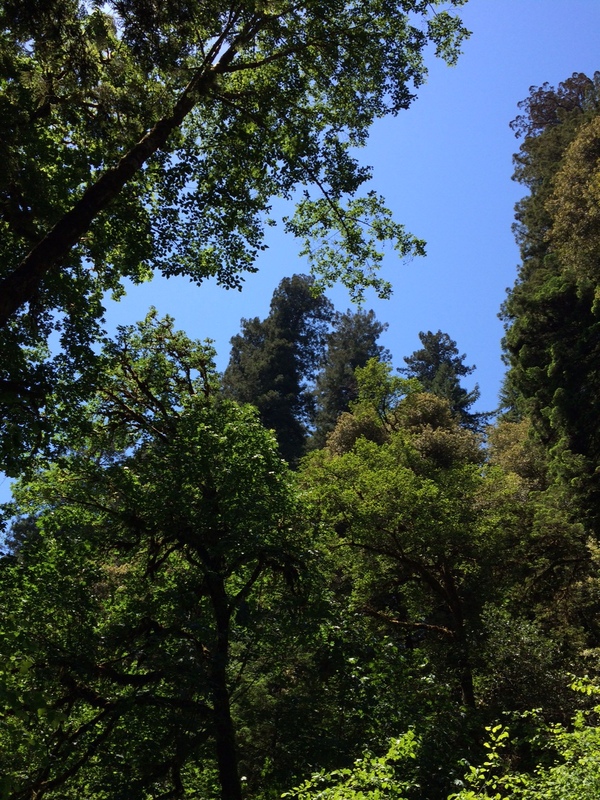 And along, below, and above these steppes and pockets, are sets of really large redwoods. Ones Jerry Beranek calls Class AA and Dave Baselt describes as Giants. Many are single stem, but there are others that started as adjacent single stem and then fused as their diameters expanded. 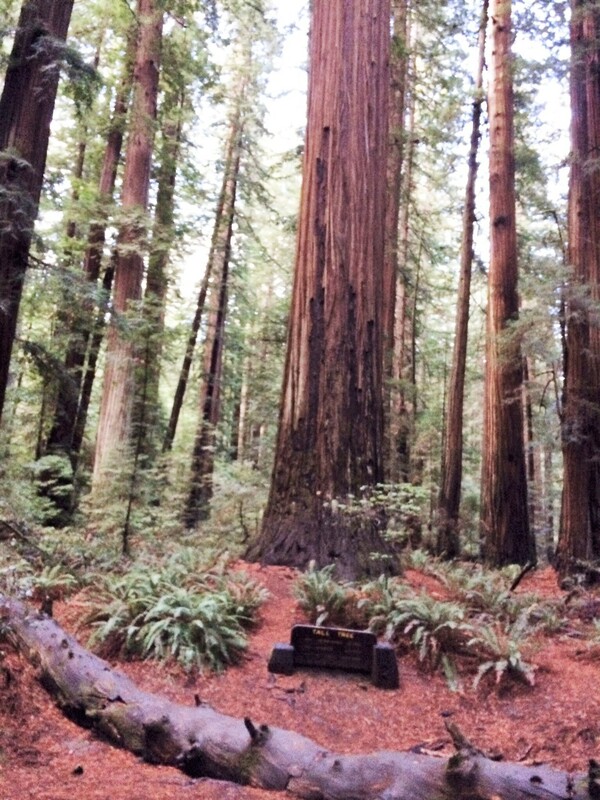 The two big redwoods shown below start the Valley of the Giants. They are right across the trail from each other. One has a spectacular up trunk burl holding a fern garden. 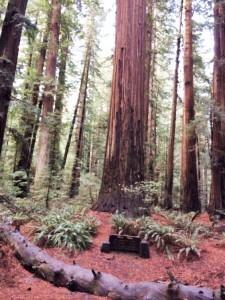 Some of the big redwoods can be seen in their full profile, while others are cloaked by the undergrowth or other trunks. Here are some views along the trail. 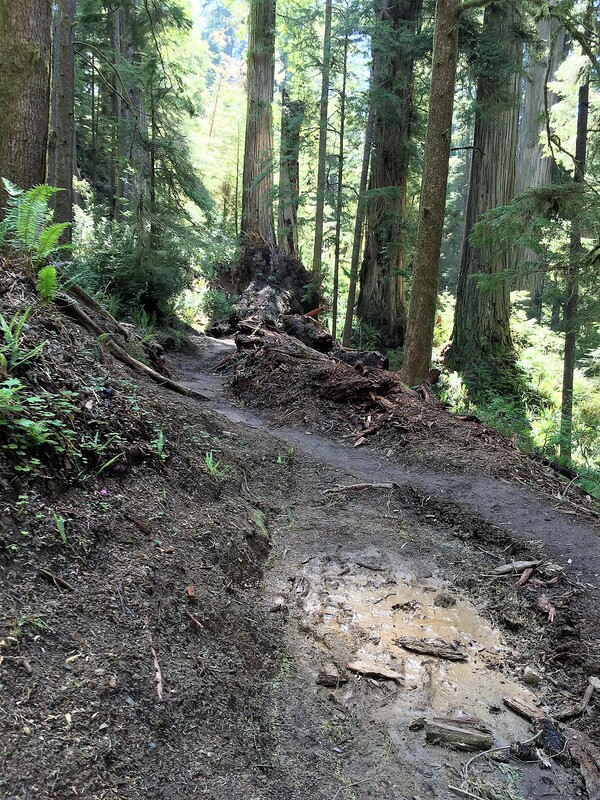 Crater in trail on hill down to Boy Scout Tree, caused by redwood falling across the trail. 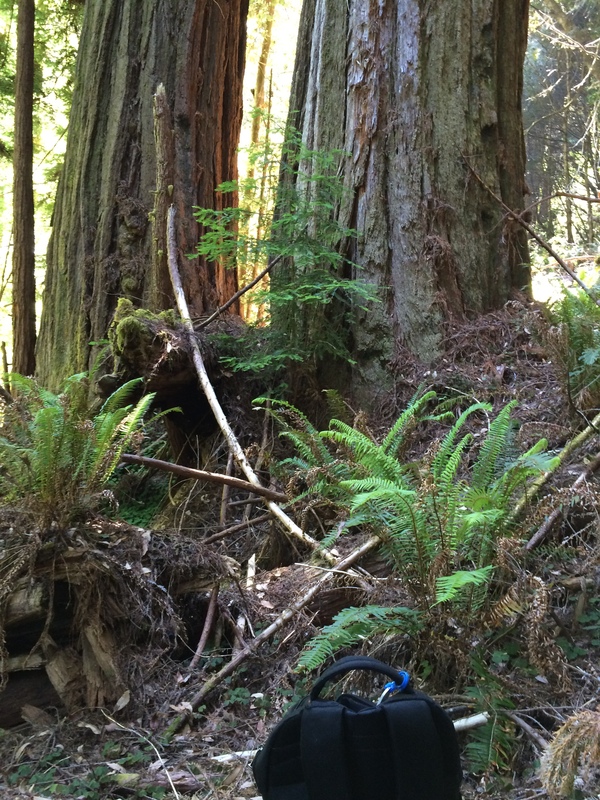 Big redwood on trail down to Boy Scout Tree with reiteration, burl, and fern garden low on the trunk. 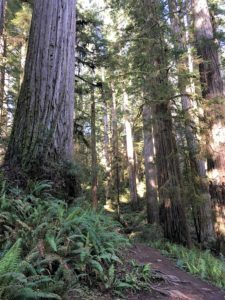 As the trail enters the Boy Scout Tree area there are still plenty of nice redwoods, and Sitka spruce start to make an appearance. Soon the spur trail on the right that leads up to the Boy Scout Tree is encountered. 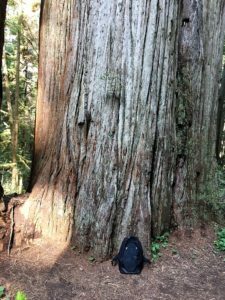 The Boy Scout Tree is an impressive fused redwood. From the Boy Scout Tree area the trail continues to descend and winds around a bend, where Fern Falls makes a sudden appearance. The falls are quite spectacular, especially when the flow rate is high such as the day I encountered them. While at this end of the park there is a hint of Crescent City, with an occasional hum of truck tires or the harbor horn. Just a whisper, nothing unpleasant and it adds to the hike. The hike back was just as enjoyable though maybe a little more tiring going up the tall hill from the west side. But not too strenuous and the downhill jaunt to the parking lot at Howland Hill road was fun. Redwood thunder is an uncommon but not rare event. 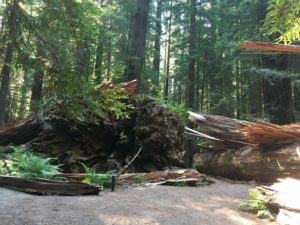 It occurs when a large redwood tree falls to the forest floor, sometimes striking and taking other redwoods, firs, spruce, oaks, and maples with it. 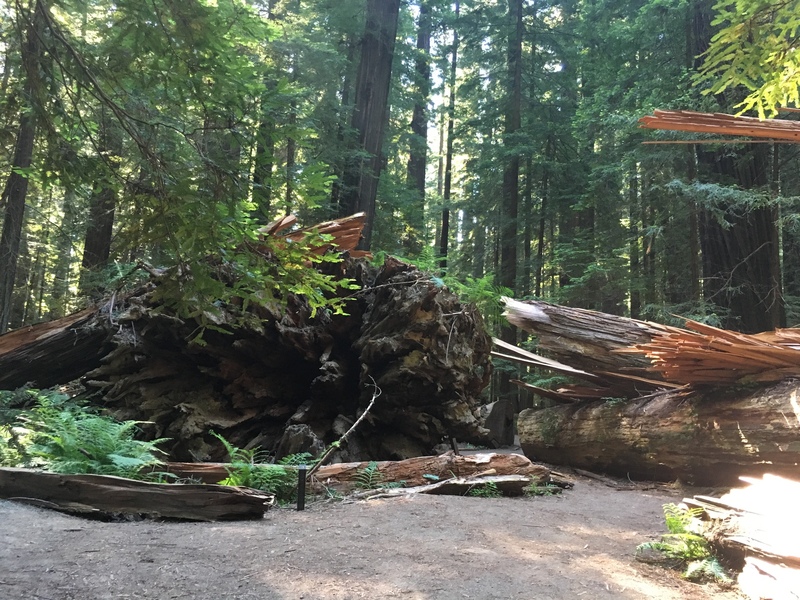 A cubic foot of redwood weighs 50 pounds, so if a moderately large 20,000 cubic foot redwood topples that is a million pounds, or 500 tons of wood crashing to the earth. 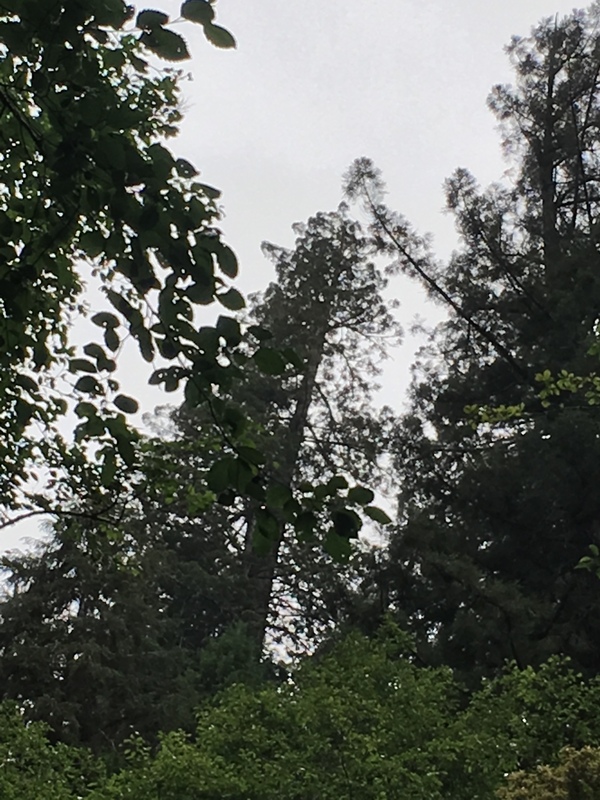 For redwood thunder to occur usually soaked soil and wind are required, though if the tree fractures on itself soaked soil is not an ingredient. 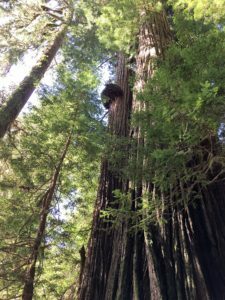 Sometimes before redwood thunder occurs the tree will lean against an adjacent tree, with the trunks and branches rubbing with the wind and making screeching sounds like giant stringed instruments. 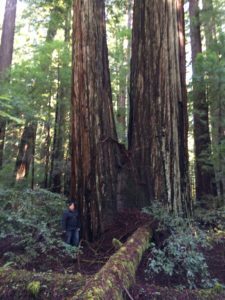 All redwood trees eventually topple, or at least break off down to a low point on the trunk. If a given old growth redwood has a one in a thousand chance of falling in any given year than that means, based on acres of old growth redwoods, the average annual tree fall count in the large redwood parks is about 300 trees, per park. 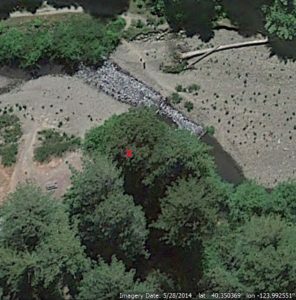 If there are multiple trees involved in a tree fall or if the tree falls across a creek, the tree fall is noticeable in Google Earth. 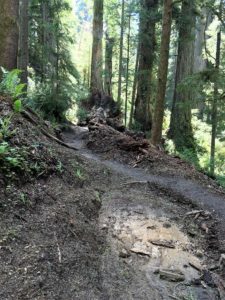 If you hike the same trails over several years you will for sure see trees that have recently fallen. 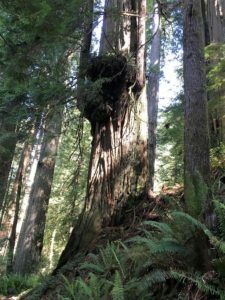 Their upper trunks are huge and their logs run sometimes more than a football field along the forest floor. 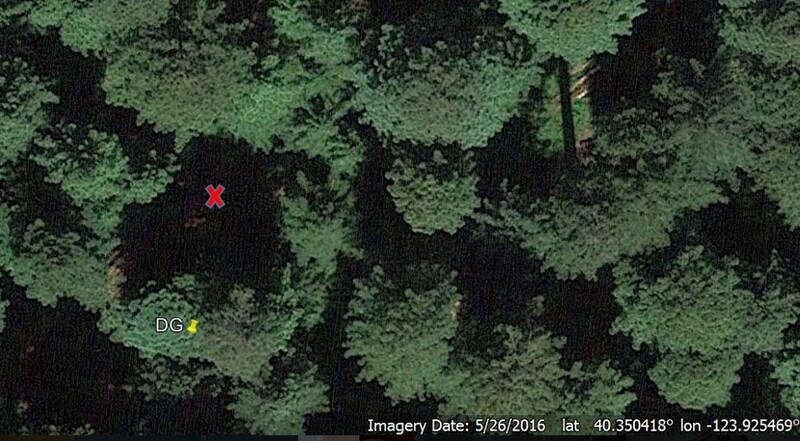 Here are several examples of tree falls I ran across in 2016. 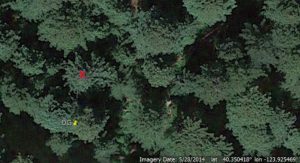 Included are a picture I took of the tree fall accompanied by before and after Google Earth views of the tree fall areas (using Google Earth historical imagery). In Humboldt redwoods a neighbor of the big Dyerville Giant log fell in the late spring 2016. Its trunk shattered and splintered into sections where it struck the Dyerville Giant log. Another recent tree fall in Humboldt was in the area where a seasonal foot bridge is put in to link the Rockefeller Redwood area to the Giant Tree area on either side of Bull Creek in the upper Bull Creek Flats. 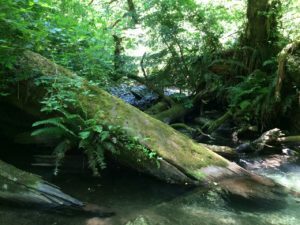 The new big log is used a lot to cross the creek, though it would be a pretty tough eight foot or so fall from the log to the rocky creek bottom if your foot or the bark slipped. 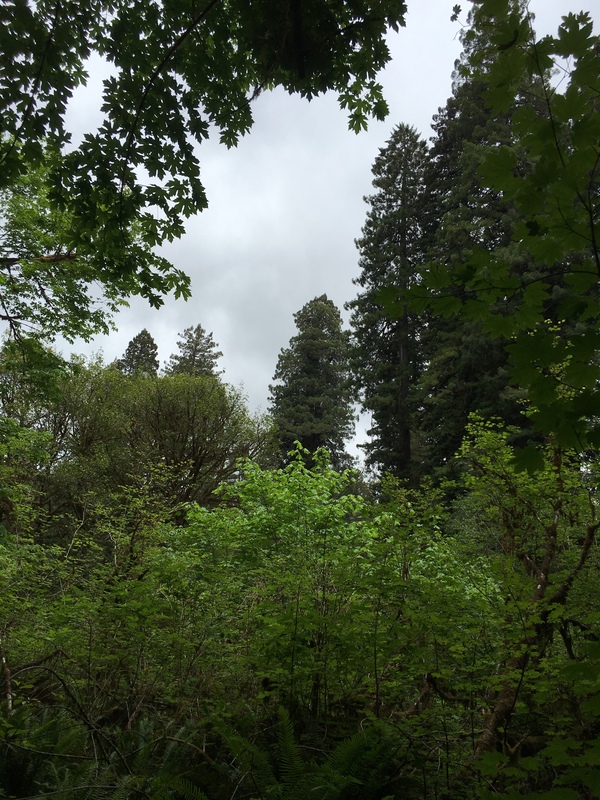 A third fall in Humboldt occurred in Harper Flat. 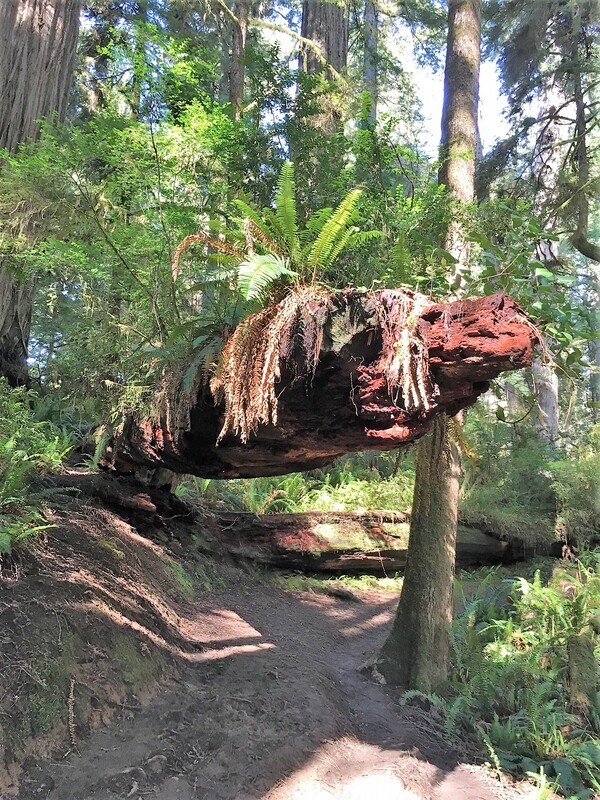 The tall north side of a twin trunk redwood fell in the last couple years. 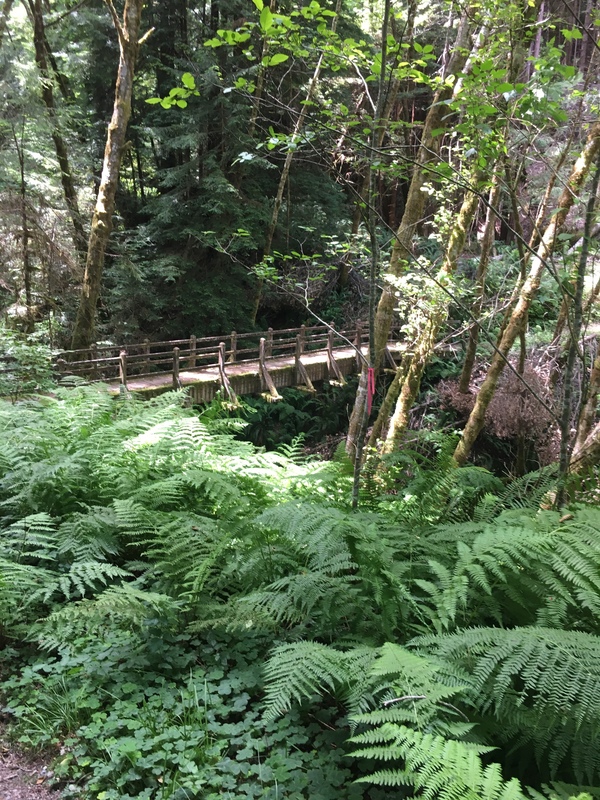 The final example is in an area of tall hillside redwoods on the east side of Redwood Creek a little north of McArthur creek near the seasonal foot bridge. 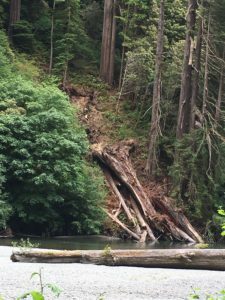 Here the tree fall took out a number of redwoods and the whole group of fallen trees is slowly sliding down toward Redwood Creek. 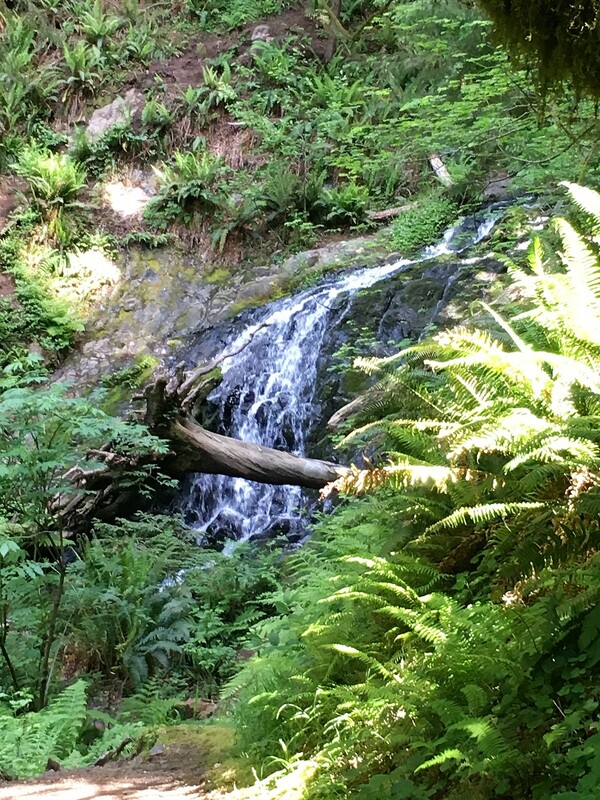 Redwood Creek tree fall area, trees are slowly sliding downhill. A recently fallen redwood is a great opportunity for whole tree research once the soil in the fall area has stabilized. The root system and affixed soils can be studied without any digging, this is the big primary benefit. 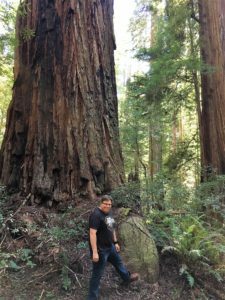 But also core samples can be extracted without having to climb and core living trees. 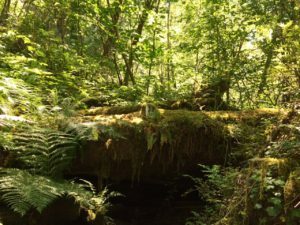 The canopy structure can be measured and reviewed without climbing and an unlimited amount of destructive sampling can be done. 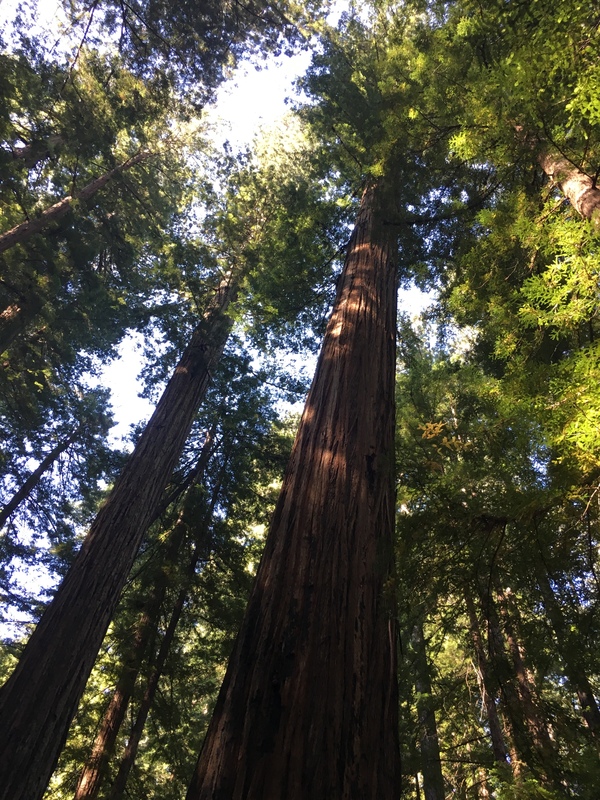 Hyperion and Helios are remarkably similar redwoods in some ways. 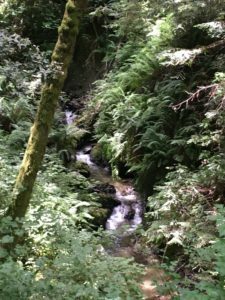 They both grow on steep slopes above Redwood Creek tributaries. Their diameters and heights are very similar. But there is one big difference – Helios is 2040 years old versus Hyperion is a sprightly 1260 years old. Then also Helios has reiterations in its crown versus Hyperion does not. A reiteration is regrowth after breakage. I started to think, I wonder what the height of Helios was before its top broke off and grew back. Was it once taller than its current height of 377 feet or so? Well, I think it was taller, a little over 400 feet tall, and that was not so long ago. The idea is to review diameter at 80 meters in height for Helios and Hyperion, then for calculation purposes adjust Helios’ diameter at 80 meters downward a bit due to its greater age. Then, take the amount of growth in Hyperion above 80 meters as a function of its trunk diameter at 80 meters. This is then applied to the Helios diameter at 80 meters to arrive at a Helios height before reiteration. Remember Hyperion has no reiteration in its crown. 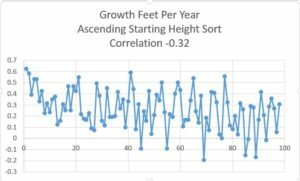 Then to get the approximate date of the Helios reiteration take the Helios average change in height per year and apply this to the amount of height that is above the reiteration. 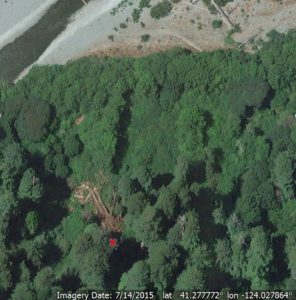 So it can be inferred there was at least one 400 foot redwood in the past, it was Helios. The top was probably blown out during a major windstorm between 1900 and 1925. 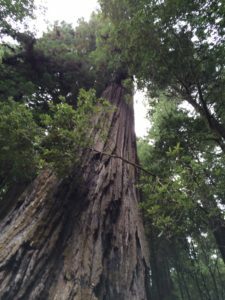 Helios may be a 400 foot redwood once more, but that will take another 70 years or so. 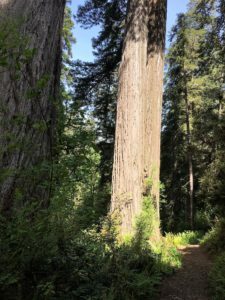 If there is a 400 foot redwood again it will probably be Helios, Hyperion, or some other redwood growing on a bench on a steep hillside with relative protection from high winds. 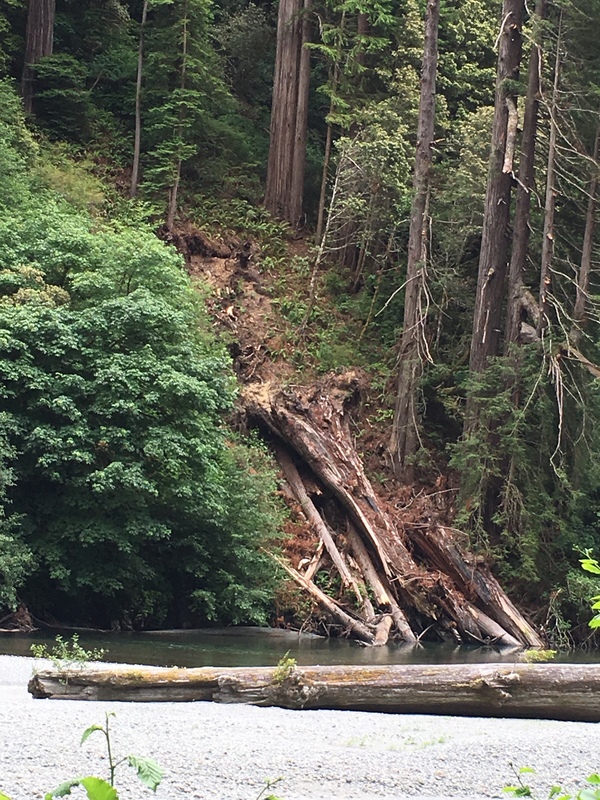 Trees growing on flats along Bull Creek or Redwood Creek are probably too exposed to high winds to avoid breakage once they get a lot taller than the rest of the surrounding redwoods. Then the other factor is the timing of the next Cascadia earthquake. That will snap off a lot of the tops. Tree height is an easy concept. Measure the top and measure ground level and you have tree height. Tree volume is more difficult to grasp. 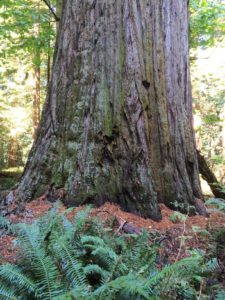 The solid parts of a tree take up a certain amount of space, and that is the tree’s volume. Since a tree is a tapering cylinder, cone cross section formulas can be used to estimate volumes of a tree by section. Then sometimes the volume of the branches is estimated as well. So tree volume is a pretty complicated business to nail down with precision. 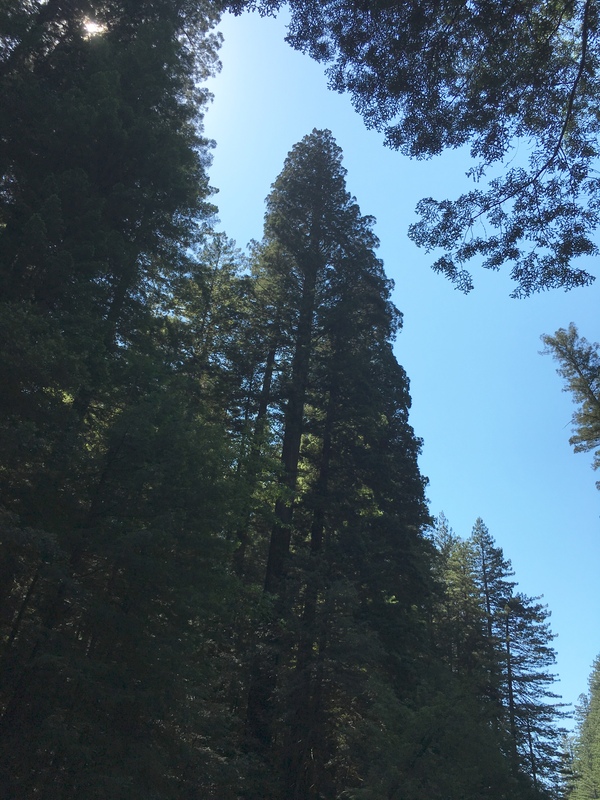 For large redwoods the formula for a perfect cone usually gets you in the ballpark for estimating tree volume. 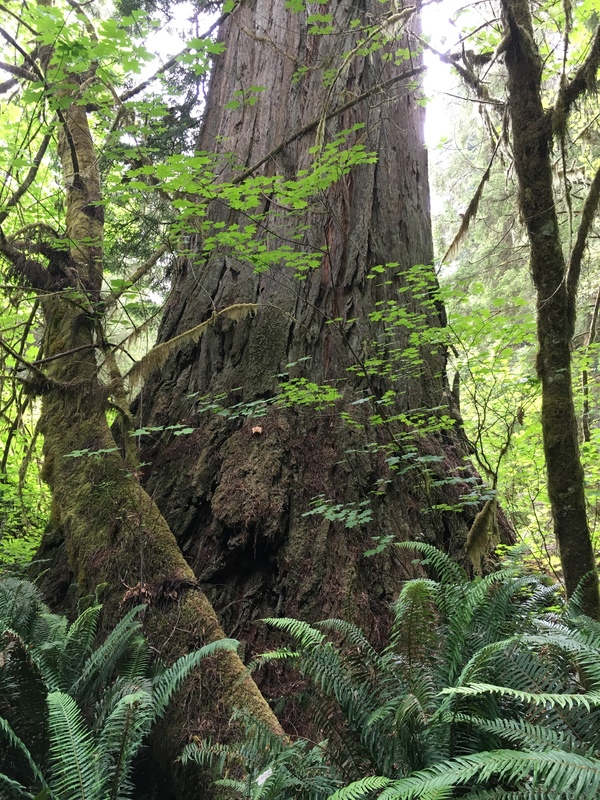 At some point in the near future technology may allow for rapid assessment of tree volumes in the same way the onset of laser rangefinders allowed for rapid assessment of tree height starting around the year 2000. Think of a quadcopter with a digital camera that can measure tree height and width at various increments as it flies around and up and down a tree’s trunk. 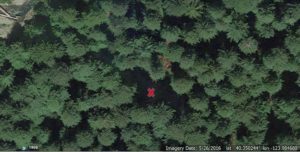 Then think of this quadcopter moving up and down a hillside, doing these measurements for all trees over a certain size on the ridge. This technology measures the trunk only. 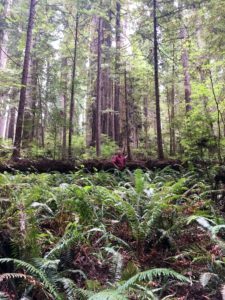 Measuring limb volume is much more complex, and generally limb volume is not included when noting the volume of the largest trees. There are lists which show the largest known redwoods in terms of volume and the tallest known redwoods in terms of height. The height list is certainly complete or near complete as airplane based LiDAR measurements have allowed for whole forests to be measured for height. However the largest volume list is incomplete, perhaps markedly incomplete. Although trails have been built through and near many exemplary redwood groves, there are many areas with exemplary redwoods which have no trails. 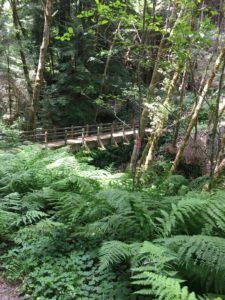 Places such as the west side of Jedediah Smith Redwoods State Park, the Lost Man Creek area in Redwood National Park, and the slopes above Redwood creek. 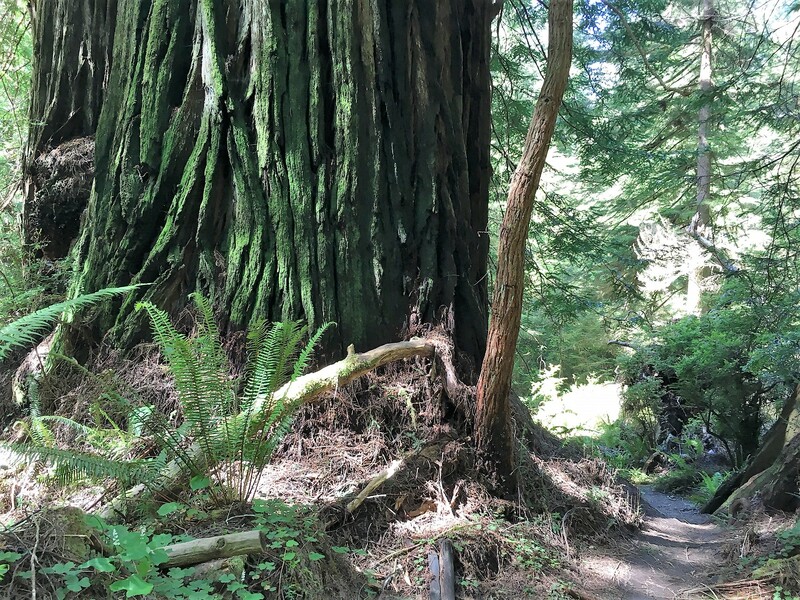 Even in areas with trails there could be very large redwoods tucked out of sight just a little bit away from the trails. 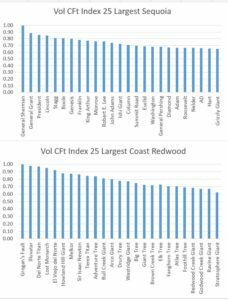 Now think about where the largest volume redwoods have been located. 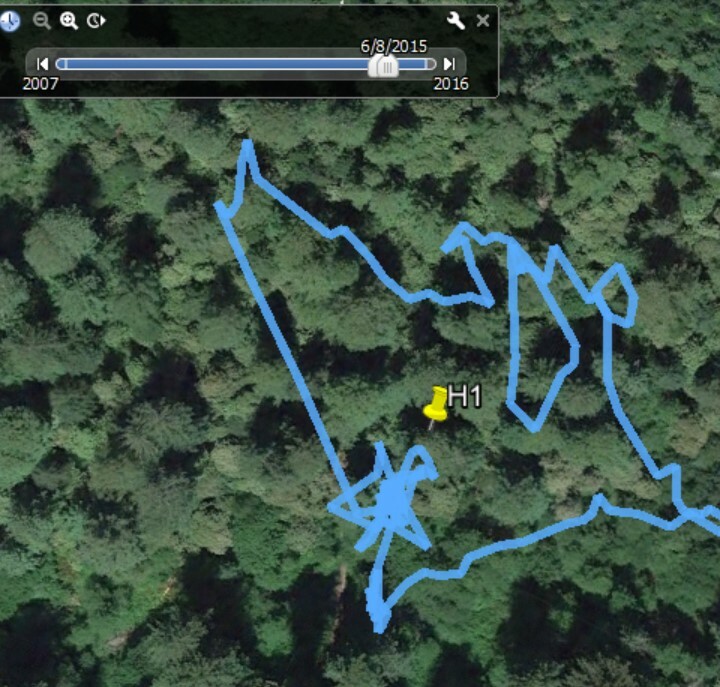 Mostly in groves that have trails. Why are so many of the largest redwoods located in Prairie Creek Redwoods? 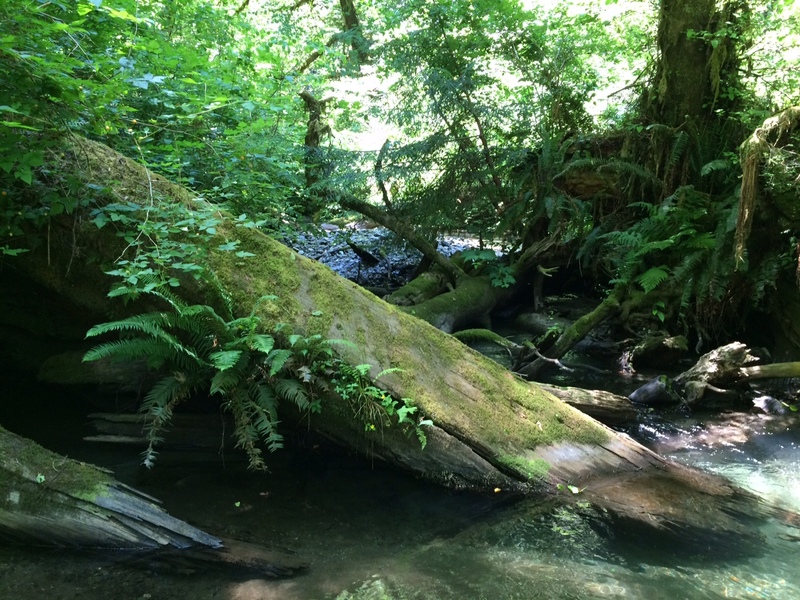 For one, Prairie Creek has a lot of great redwood habitat with lots of alluvial flats and sheltered hillsides. But also Prairie Creek has many trails through this habitat to make the identification of large trees easier. 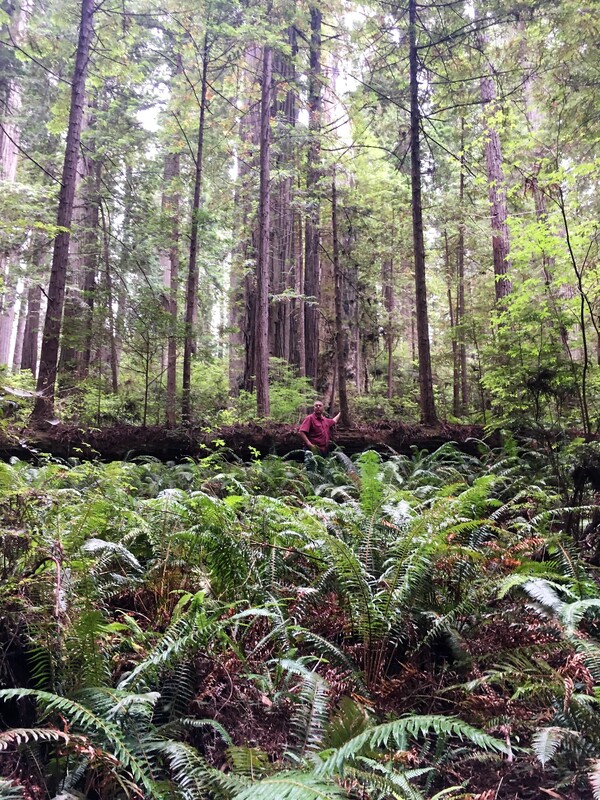 What is different between Prairie Creek and the nearby groves of Redwood National Park? Not much, at least for the groves that are relatively low in elevation. 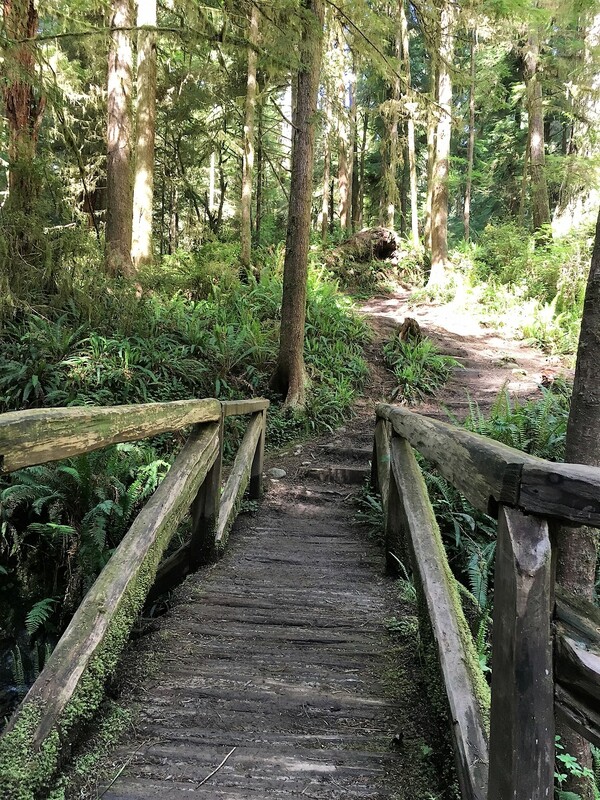 But Prairie Creek has a much more complete trail system through its groves. Let’s amplify this point with some statistics. 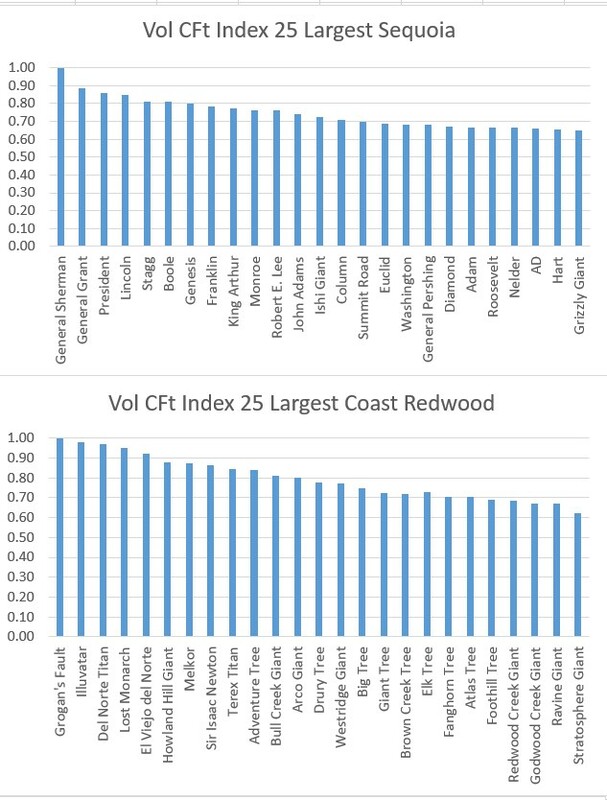 If we assess the volume distribution of the top 25 giant sequoias and top 25 coast redwoods we see the relative volume between the largest and 25th largest trees in each group is similar. In other words, each group covers the same relative range in volume. 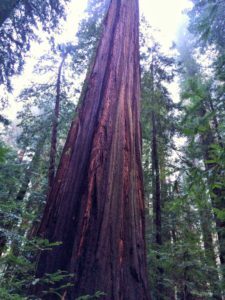 So sequoias and coast redwoods have the same relative range from the largest through the 25th largest tree. 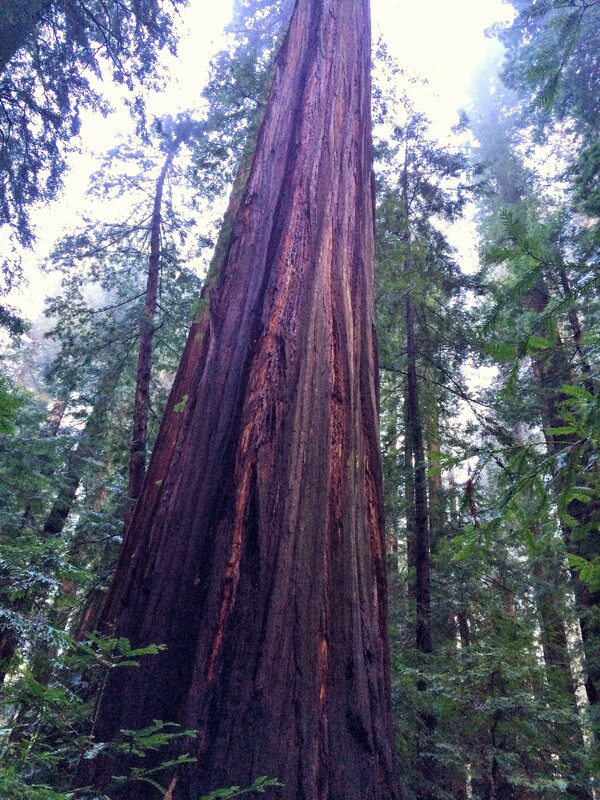 But there are many, many more mature redwoods than mature sequoias. 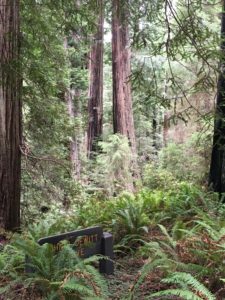 Here the coast redwood old growth acres include only the northern redwood parks. 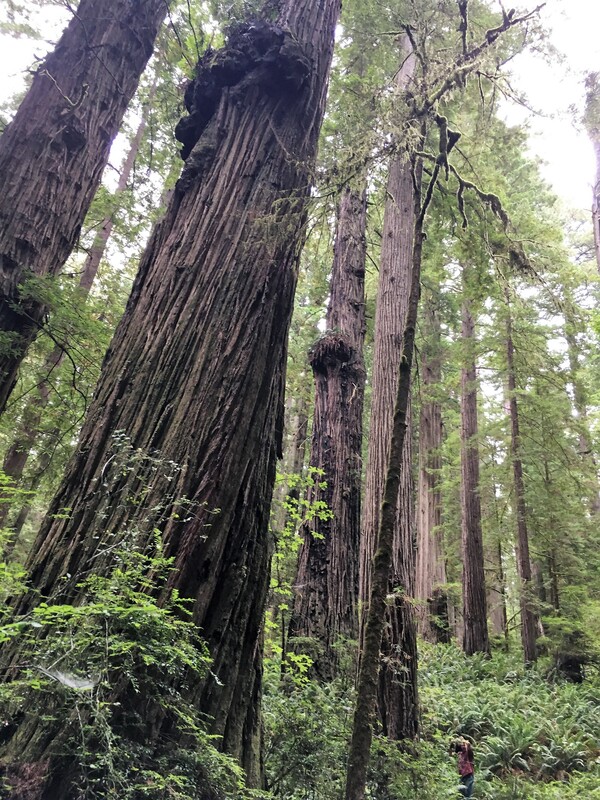 So there are 6X as many old growth redwoods in their prime range than the total number of old growth sequoias. Yet the band for the top 25 trees in each species is the same? 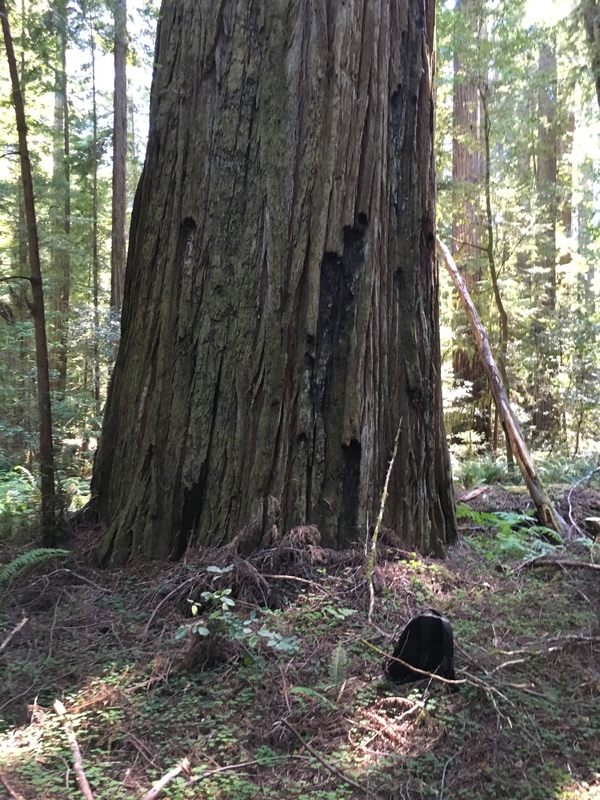 There is only one explanation for this, and that is many, many of the largest redwoods have been missed, so far. 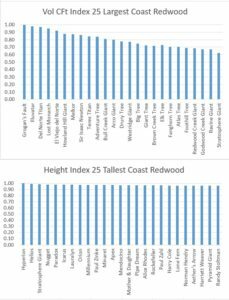 As a second comparison, let’s review the relative volume distribution for the twenty five largest redwoods versus the relative height distribution for the twenty five tallest redwoods. How do those bands look? Well they look really, really different. 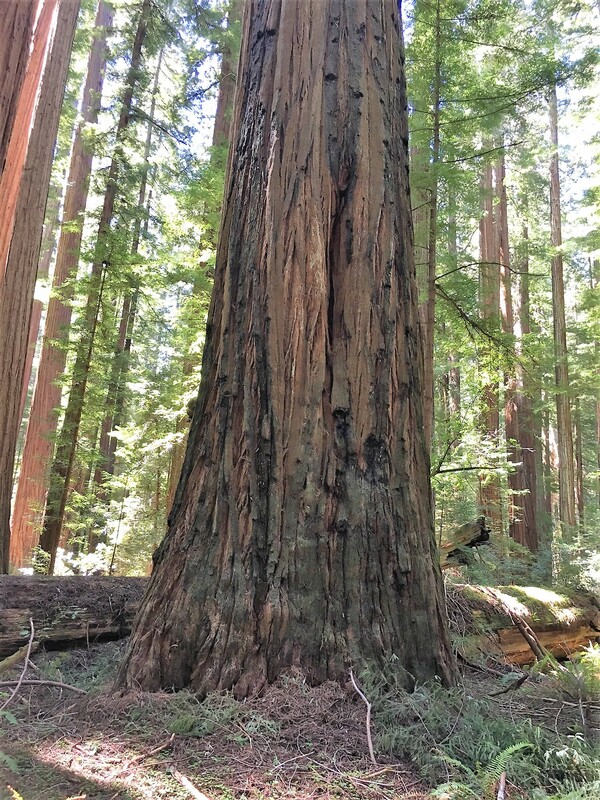 The 25th tallest redwood is about 95% as tall as the tallest redwood. The 25th largest redwood is about 60% as large as the largest redwood. Why the difference? 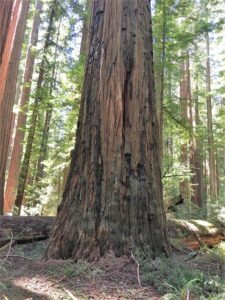 All or almost all of the tallest redwoods have been identified, through the use of laser rangefinder and LiDAR technology. 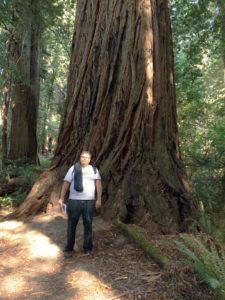 And many of the largest redwoods have not been found, as there is no comparable technology to quickly assess tree volume. 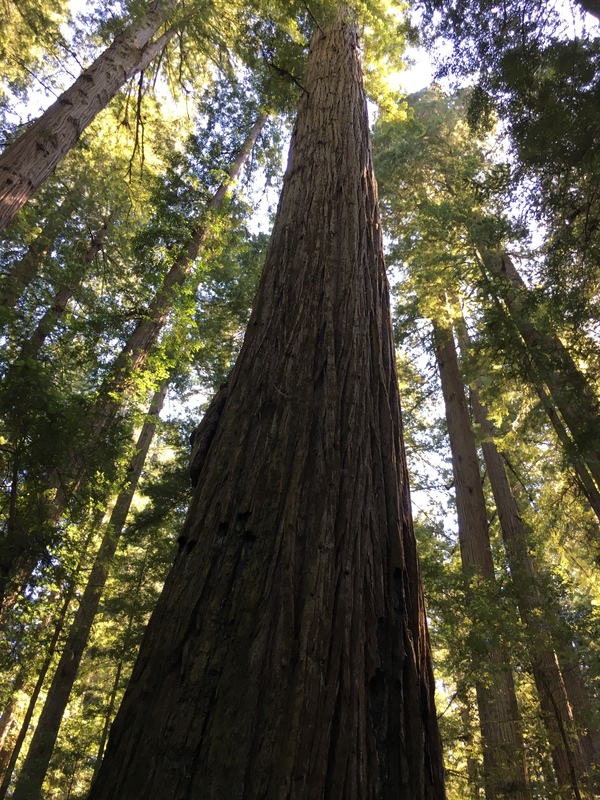 The current largest coast redwood tree lists have 25 trees over 24,000 cubic feet. That is only a sample, there are probably over 100 such trees. 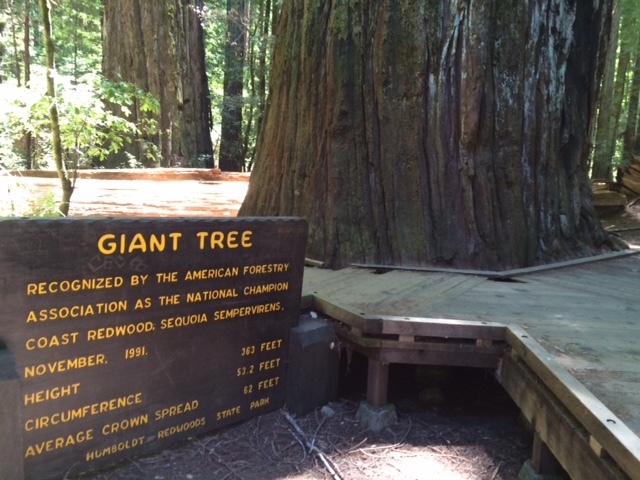 And almost certainly several trees are out there that are larger than 38,000 cubic feet. So lots of discoveries to be made. And lots of upcoming technology in the form of quad copters with smart digital imaging to assist researchers in making the discoveries.